Previously on Electric Thrift I mentioned that I passed on buying a Sony Mavica at Goodwill because it was missing the power supply and proprietary batteries. 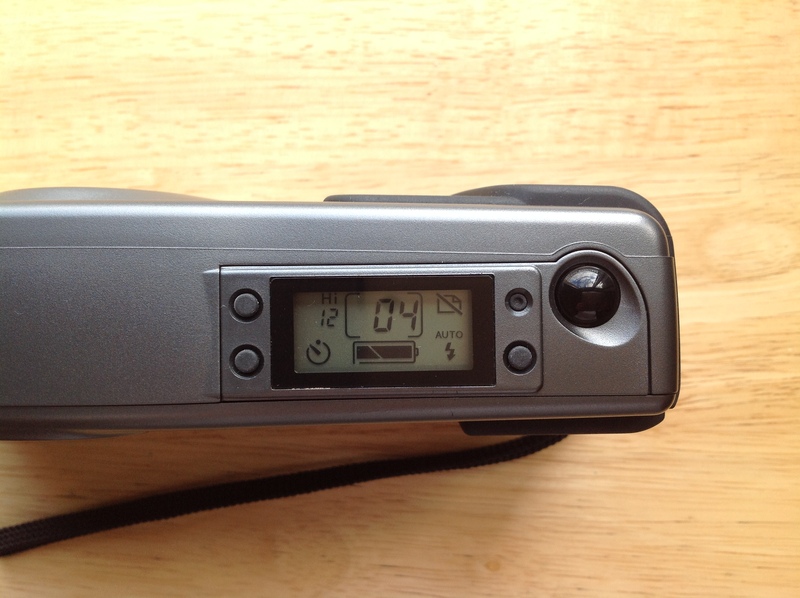 I’m very glad I didn’t buy that camera because shortly after that I found an even older digital camera! The oldest digital camera I can remember seeing was the Apple QuickTake 100 my 5th grade teacher, Mr. Bennett used in about 1995. 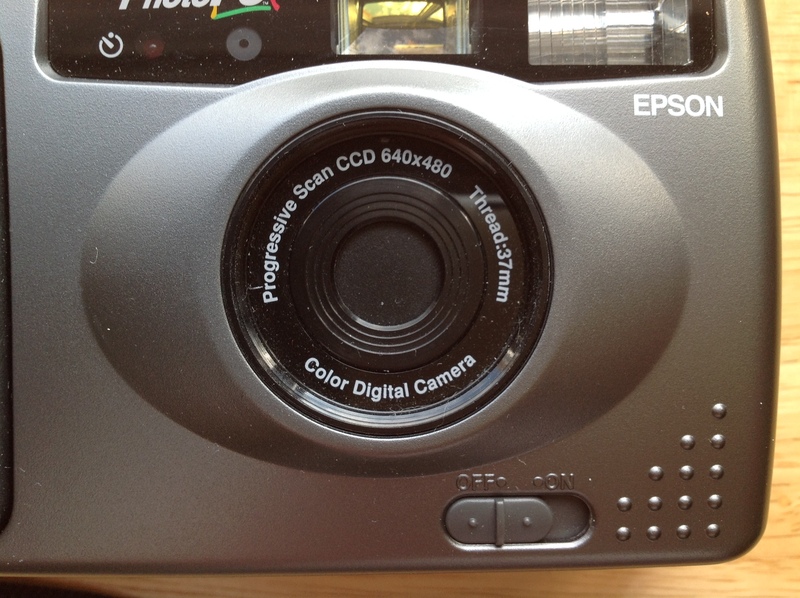 The second oldest digital camera I’ve ever seen is this Epson PhotoPC I recently found at Village Thrift. Village Thrift has a “showcase” which is a section of supposedly more expensive items positioned on shelves behind a counter so that you have to ask the cashier to take a closer look. This creates a dilemma because often times it can take awhile to get the attention of the cashier. You have to really want to see an item in the showcase to justify waiting but the items are kept too far away to get a good enough look to really get interested in them. 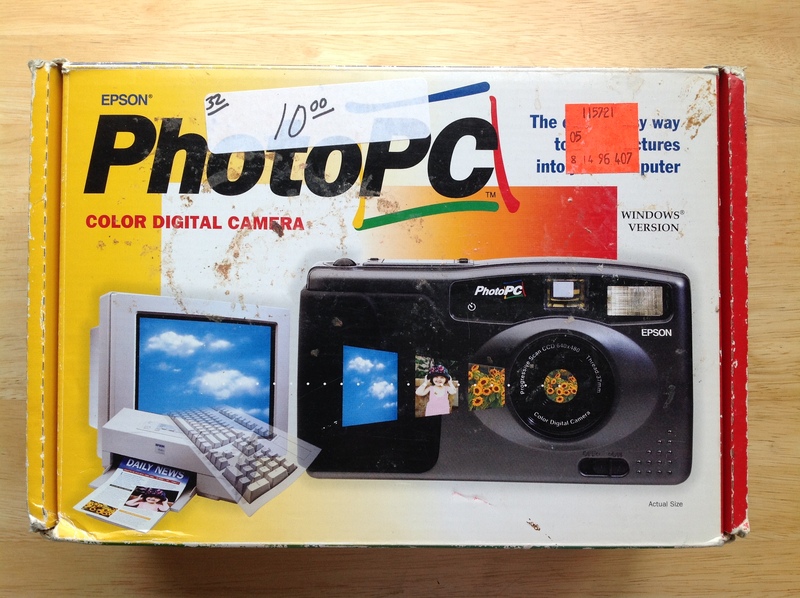 I had seen the PhotoPC box back there for several weeks and never grasped the age of the thing. Luckily there’s this place where the showcase’s counter ends and sometimes items spill over from the showcases’s rear shelves onto the normal, more accessible shelves. 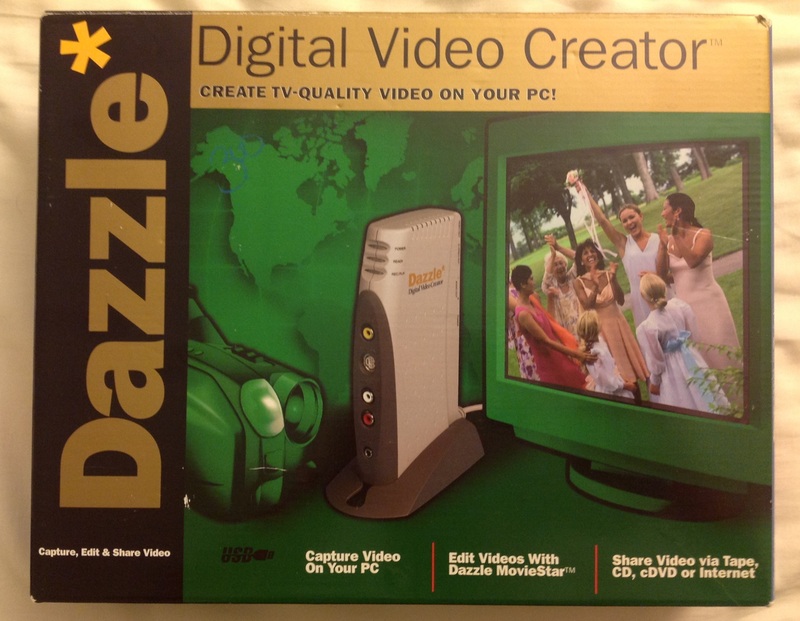 That’s when I finally go a close look at the box and realized this was a digital camera box with screenshots from Windows 3.1! 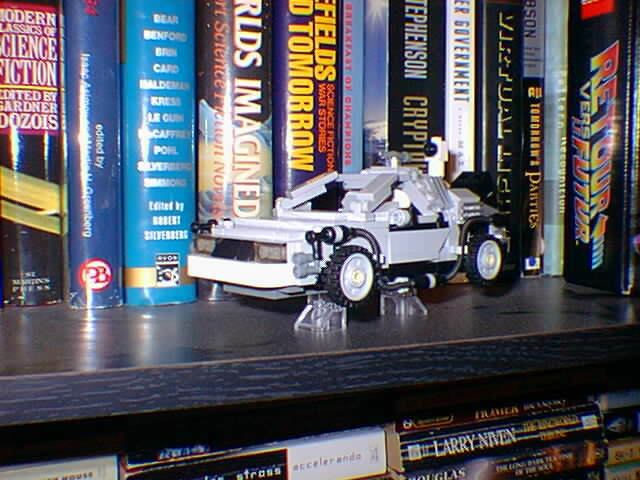 “Copyright 1995 Epson America, Inc.” This is a survivor from the digital camera Jurassic period. We tend to think of digital cameras as springing into existence as luxury objects in the late 90s, hitting their prime in the 2000s as people realized the utility of getting photos online and becoming ubiquitous after 2007 as the cheap ones were integrated into smartphones and tablets and the more expensive DSLRs overtook their film counterparts. 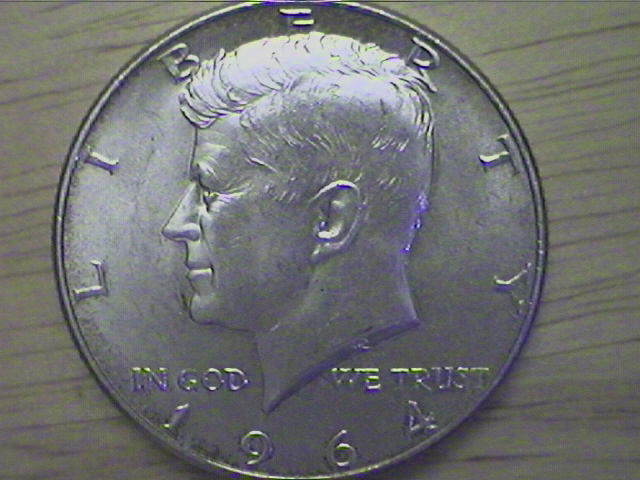 According to digicamhistory.com this was among the first digital cameras under $500. You can see how they needed to make the camera extremely simple to meet that price. 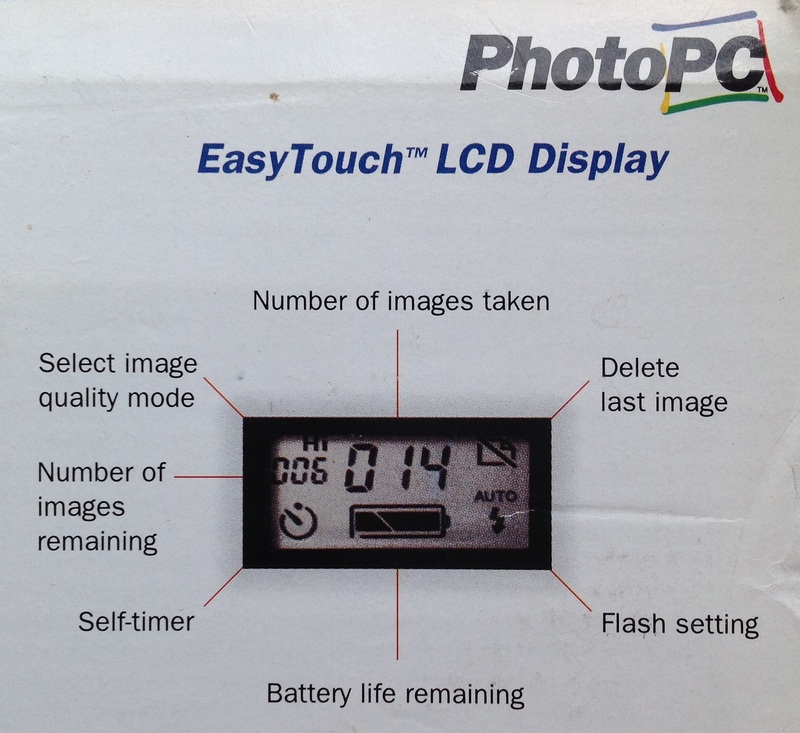 Even though other contemporary digital cameras like the QuickTake 100 had LCD screens, the Epson PhotoPC has none. There’s just a conventional viewfinder. As a result, you can’t review photos you’ve taken on the camera itself, you have to connect to a PC. There is however, a button that deletes the last photo taken. Additionally, because there’s no screen you have just a tiny LCD display to tell you how the battery is doing, if the flash is on, how many shots you’ve taken, and how many shots you have left. 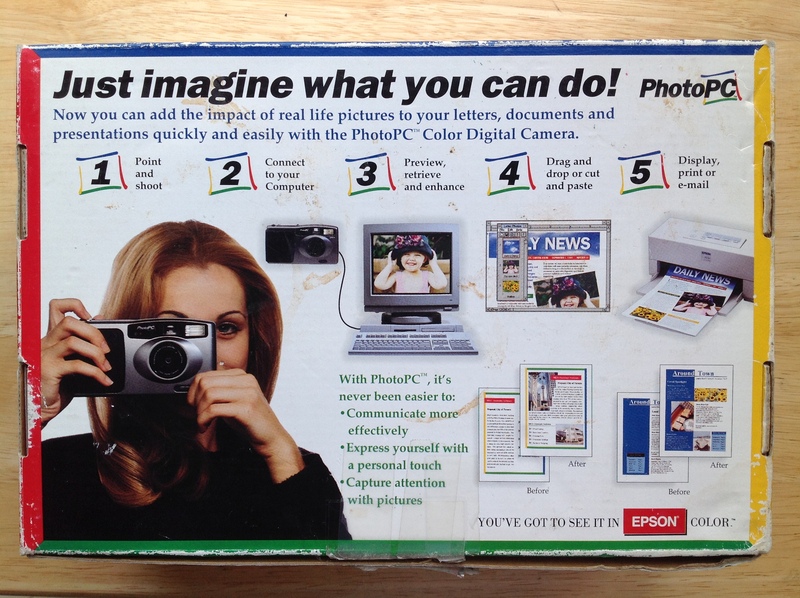 This is an esoteric analogy but the Epson PhotoPC reminds me of the Ryan Fireball: That was a bizarre Navy fighter aircraft with both a piston engine and a jet; the PhotoPC is a cheap 90s auto focus point-and-shoot camera that just happens to be digital. They’re both weird artifacts of a transitional time. 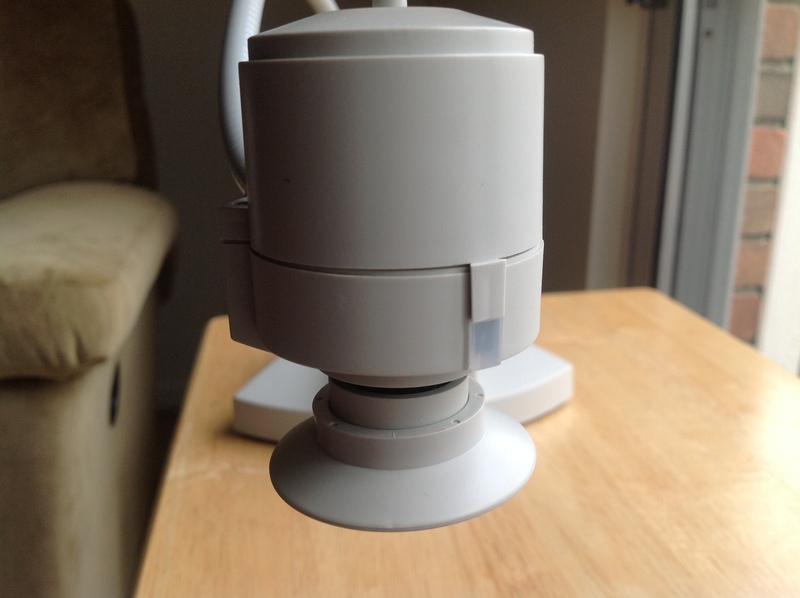 When you do connect the PhotoPC to a PC to look at the photos, you’re connecting with a serial cable because this camera predates USB. 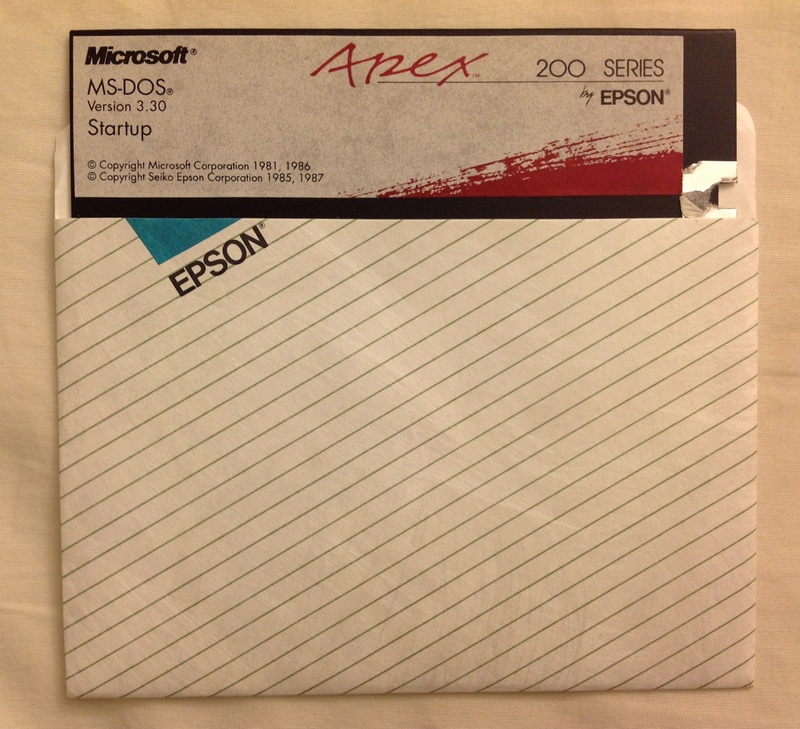 For that matter, it also predates Compact Flash. There’s 1MB flash memory built into the camera and an slot to add an additional 4MB of flash on a proprietary “PhotoSpan” memory module. 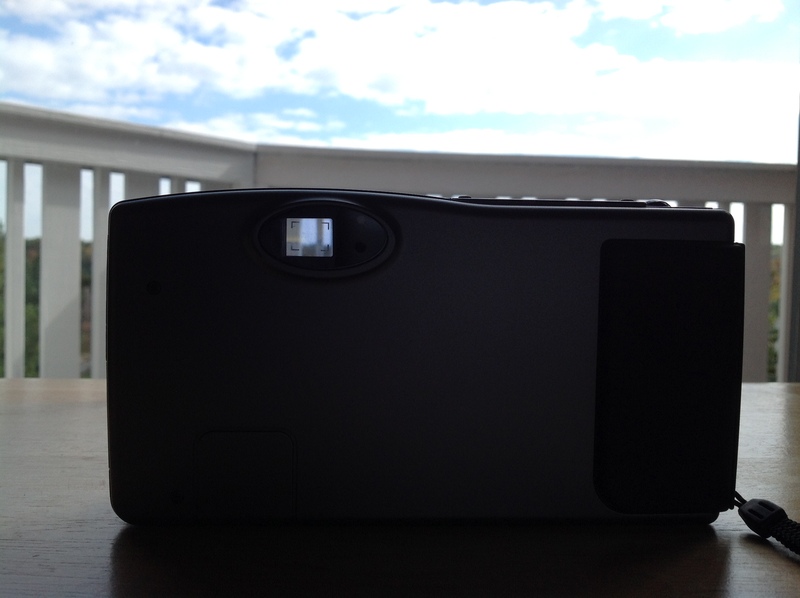 My camera has an empty expansion slot so the built-in 1MB of flash holds a mere sixteen 640×480 photos. 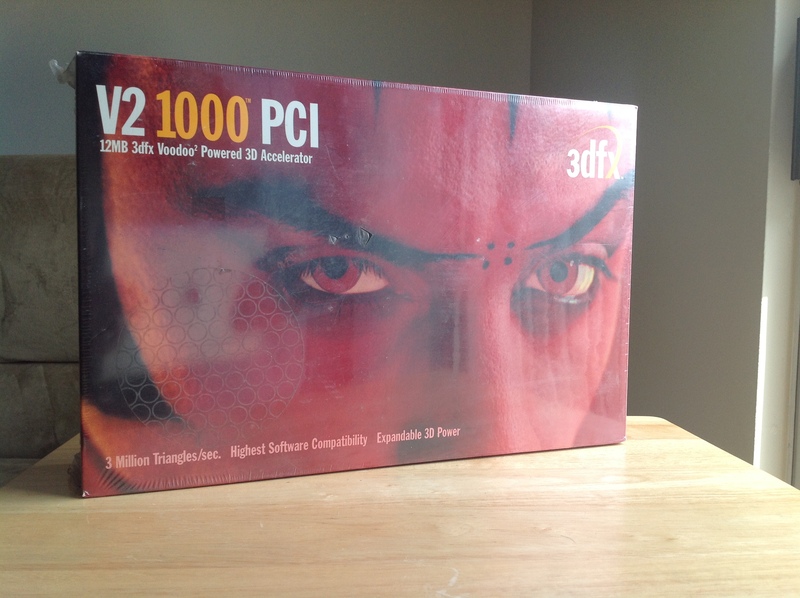 My parents old Dell Pentium III (which you may recall from the Voodoo 2 post) runs Windows 98 so I installed the EasyPhoto software, hooked up the serial cable and pulled some pictures off of the PhotoPC. 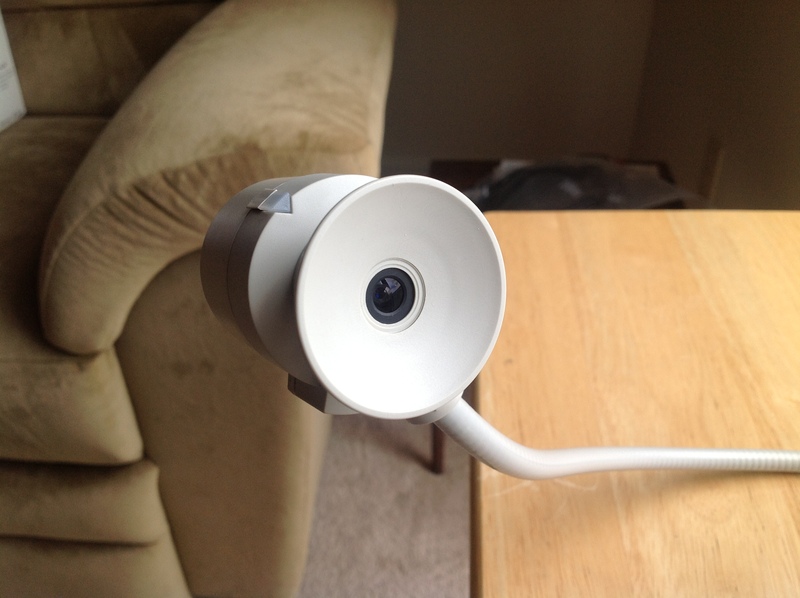 I can tell you that pulling photos off of this thing via serial cable is a lot like watching paint dry. I watched the progress bar snail it’s way across the screen and was pleased when it got to 100%…when I realized that was just for one photo. One 640×480 photo. If you’ve got a full camera with 16 photos to transfer you might as well go make yourself a sandwich and catch an inning of the ballgame while that transfers. Take a roll of photos on a film camera, have them developed, then scan them, and then presumably crop the photo and resize it for the Internet. 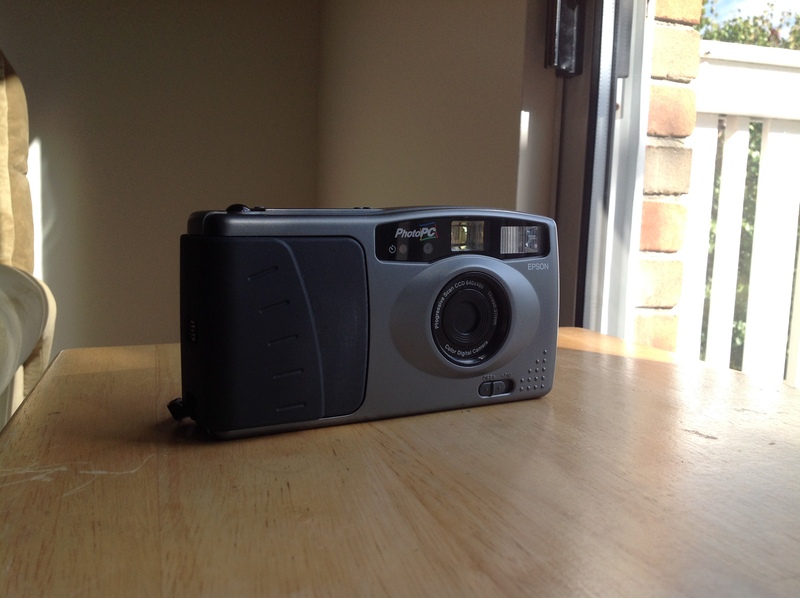 Take photos with a Polaroid camera, scan them, and then presumably crop the photo and resize it for the Internet. I’ve done enough scanning to know that that would be immensely time consuming. 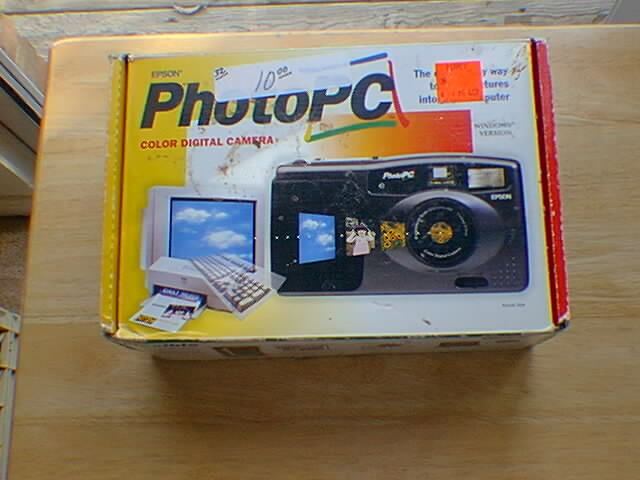 Once you had a digital camera, even a barebones one such as the PhotoPC you could almost go straight from taking a photo to getting it on the Internet. Not only that but you could take 16 photos, spend 15-20 minutes transferring them to the PC, wipe the camera and take another 16 photos, over and over. Sure, this would be no good on your trip to the Grand Canyon but if you were having a family reunion at your house or another scenario where you’re close to a PC this would have seemed miraculous. 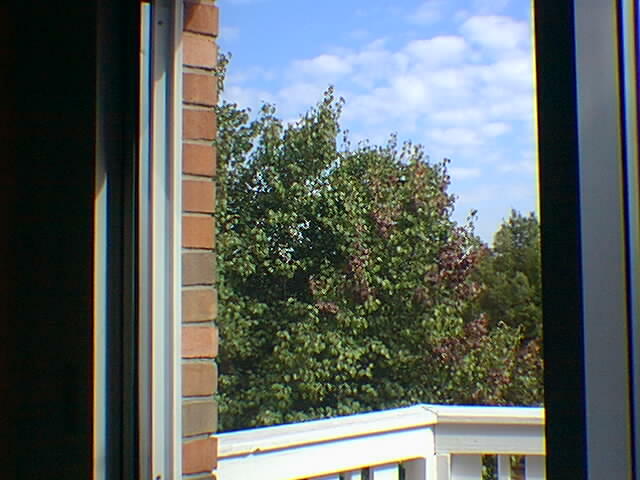 So, what do photos taken with the Epson PhotoPC look like? 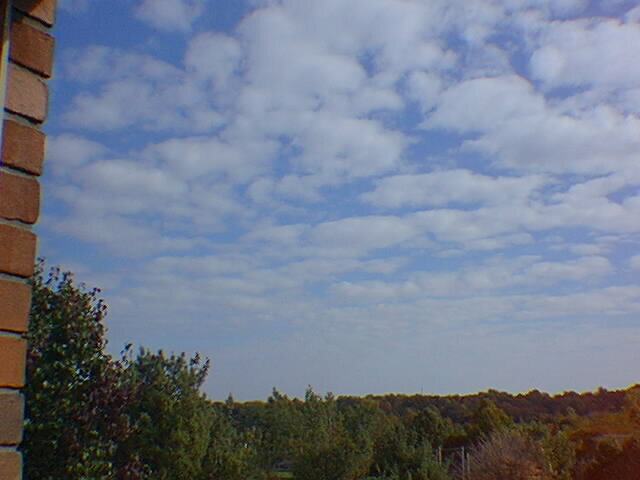 A lot like the photos I remember seeing on the Internet in the late 90s: A bit fuzzy. Strange color artifacts. Not great focus. 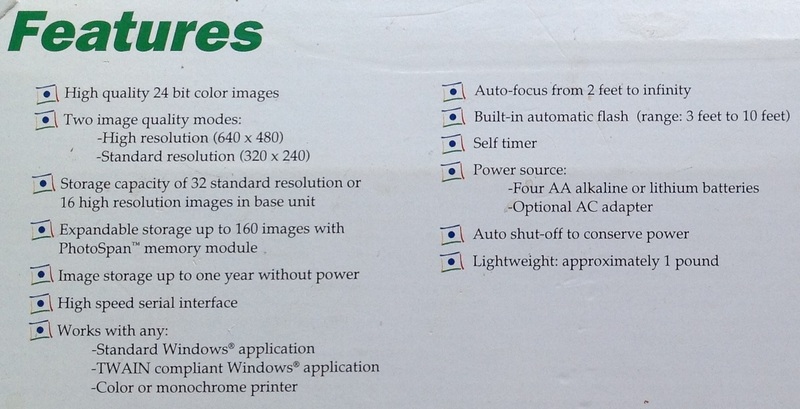 Keep in mind that in 1996 you’d be lucky to have been running 800×600 at 32bit color on your monitor. 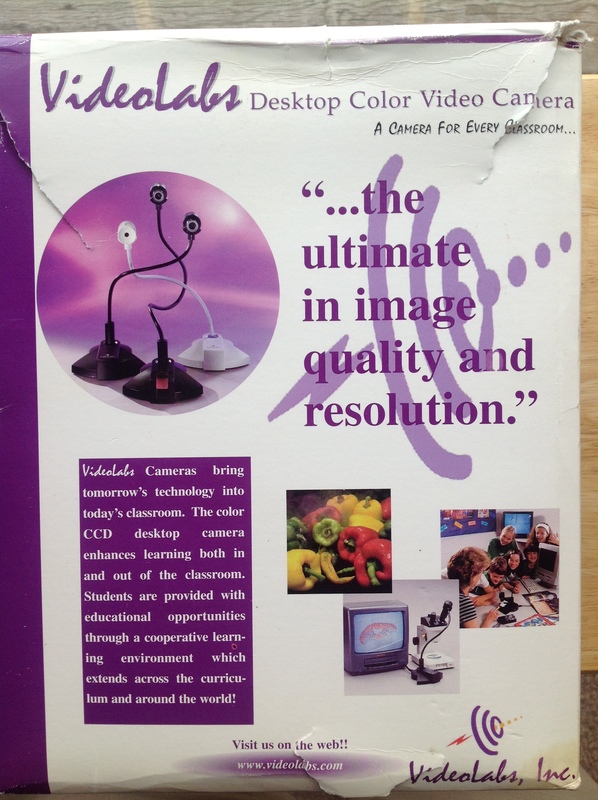 Back then, 640×480 images were serious business. The wonderful thing about finding this camera is how it is so utterly an artifact of the past but also totally tied to today. The PhotoPC was one of rat-like mammals that scurried amongst the film dinosaurs. A film camera and my iPad are of two totally different eras, but the PhotoPC and my iPad are clearly distant but related ancestors. Sometime between 2003 and 2006 I found this Apple Macintosh Quadra 700 at the old State Road Goodwill in Cuyahoga Falls. 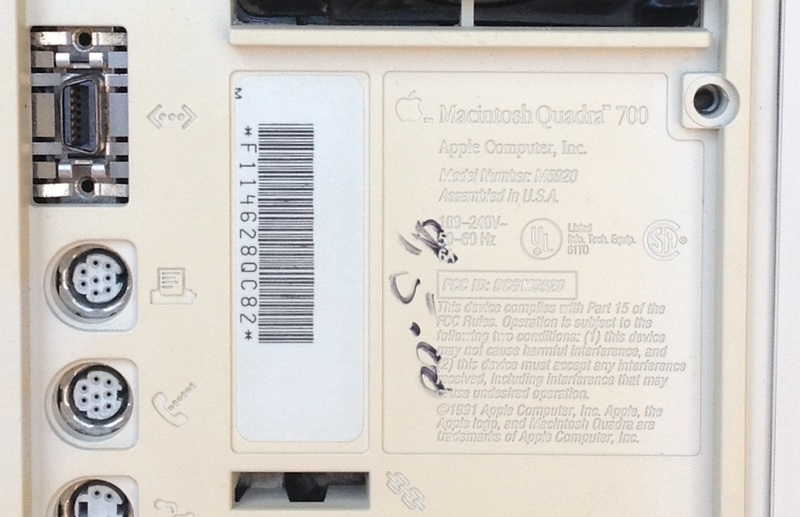 According to this Macintosh serial decoding site my Quadra (serial # F114628QC82) was the 7012th Mac built in the 14th week of 1991 in Apple’s Fremont, California factory. 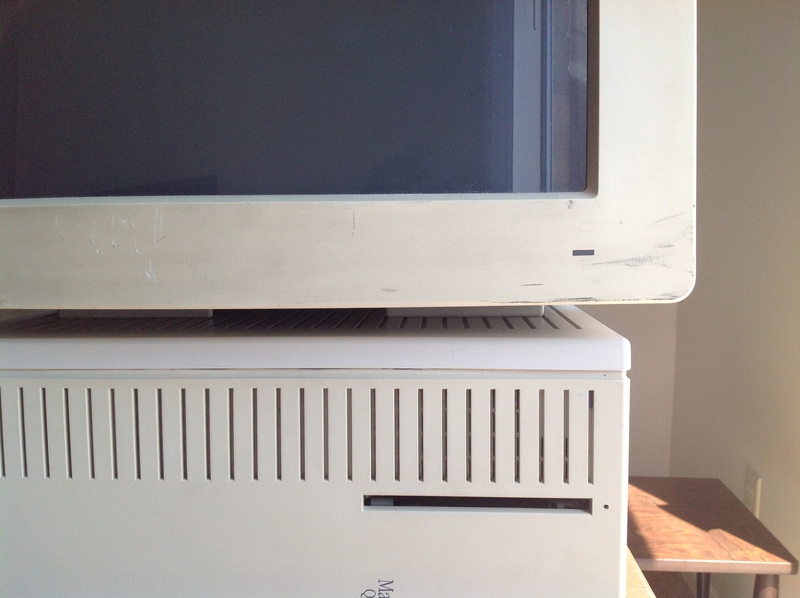 It looks like I paid $15 for the Quadra and the massive Apple Multiple Scan 17 CRT monitor that came with it. In fact, the Multiple Scan 17 is so large and hulking that I don’t feel like dragging it out of the closet to take a better photo. 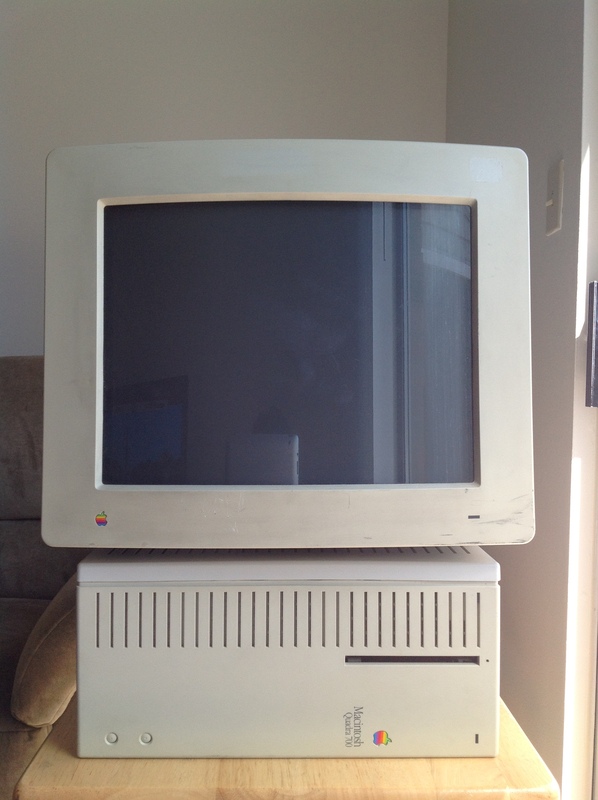 After I started this blog I dragged over most of the vintage Mac stuff out of my parents’ attic to my apartment. 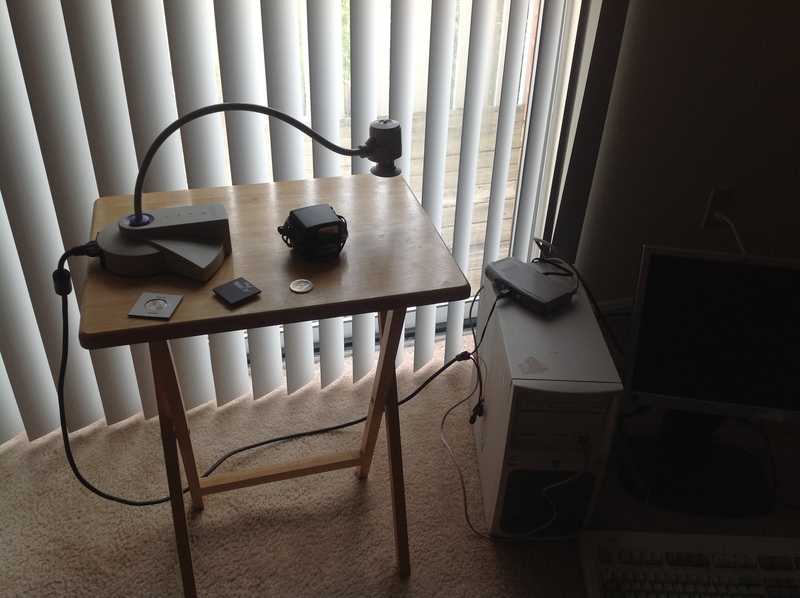 I decided that the Quadra 700 should get a semi-permanent place on my vintage computing desk. The desk (which you’ve probably seen in the Macintosh SE and PowerBook G3 entries) has a credenza that limits how deep of a monitor I can use. The Multiple Scan 17 doesn’t leave enough space for the keyboard and really restricts what else I can have on the desk. Originally my plan was to use the Quadra with an HP 1740 LCD monitor I picked up at the Kent-Ravena Goodwill so I bought a DB-15 to HD-15 (VGA) converter. 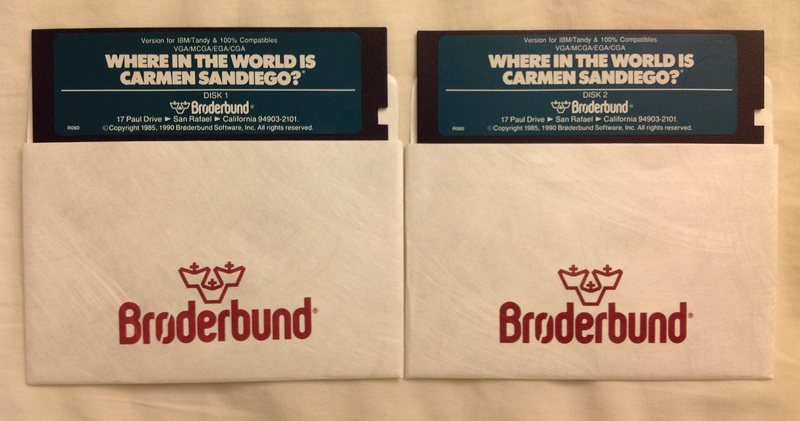 However, while digging through the Mac stuff in my parents’ attic I made an interesting discovery. 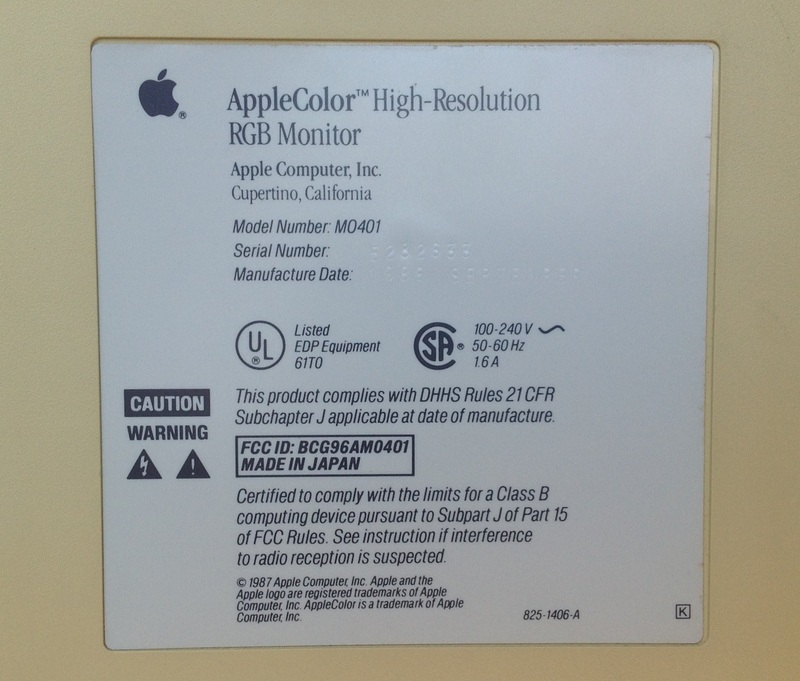 Unbeknownst to me I owned AppleColor High-Resolution RGB 13″ monitor. 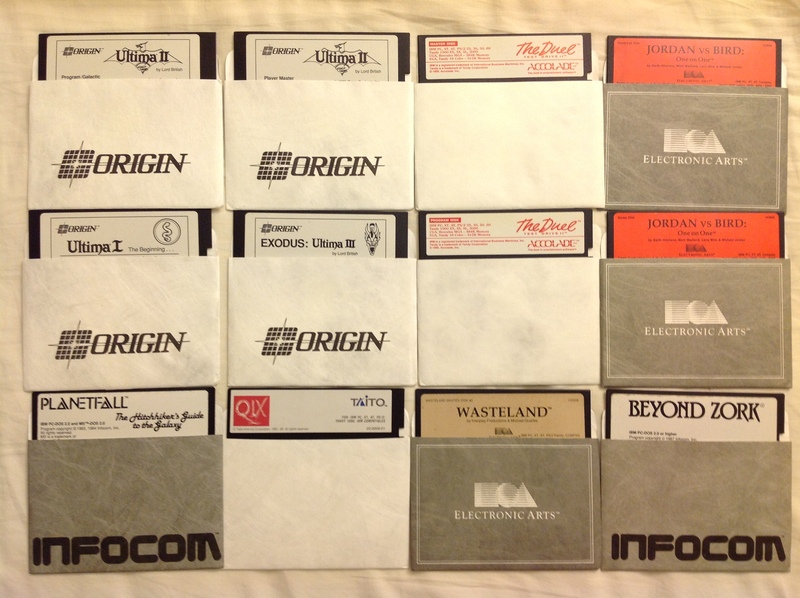 When I was still living with my parents there wasn’t really a lot of room in my bedroom for all of the vintage computing stuff I had accumulated. Often, I would lose interest in something and it would go into the attic. At some point my Dad must have brought home this monitor from a thrift store. Unlike most CRT monitors where the monitor cable is attached to the monitor this one has a detachable cable which was lost when he bought it (I have since purchased a replacement on eBay). With all of the Mac stuff put away and no monitor cable to test it with, it joined everything else in the attic and I forgot about it. 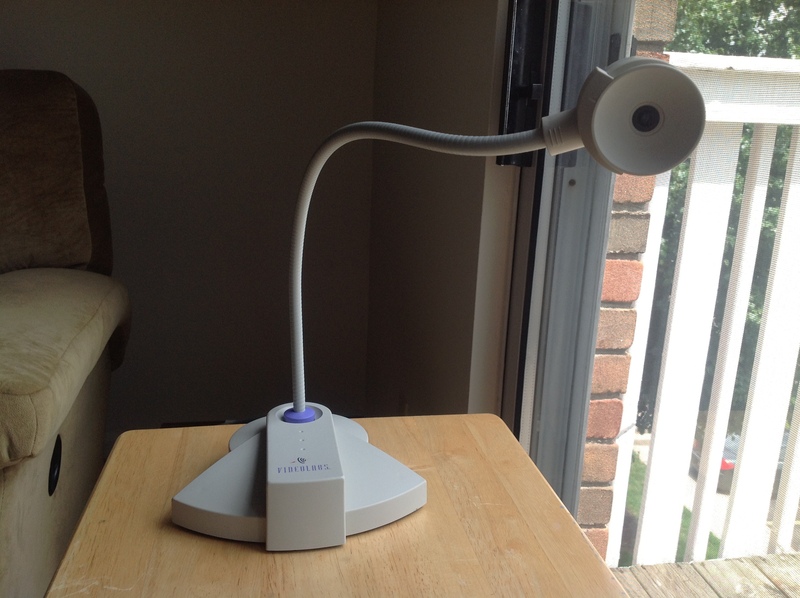 Years later when I stumbled upon it deep in the shadows of a poorly lit part of the room, I thought it was the cheaper Macintosh 12″ RGB monitor that went with the LC series. But then, I saw the name plate on the back. This was an amazing stroke of luck because that’s a damn fine monitor. 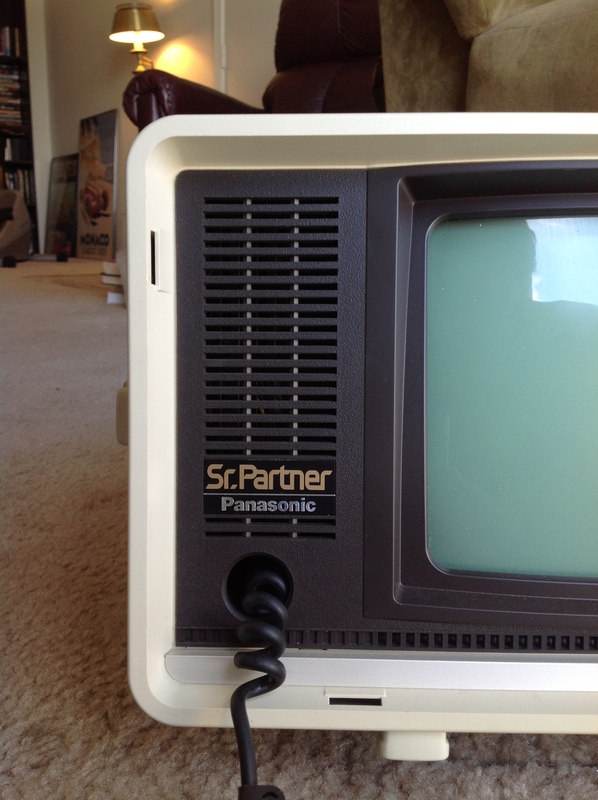 Back in the late 80s this was one of Apple’s high end Trinitron monitors. Remember those Apple brochures my mother got in West Akron in 1989 from the Macintosh SE entry? 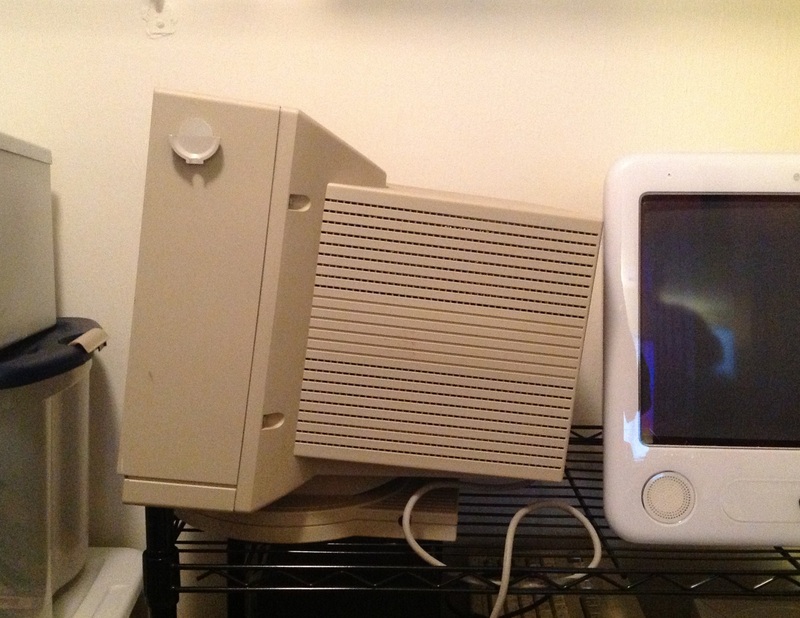 I’m fairly sure that the monitor sitting on the IIx in that picture is the AppleColor Hi-Res 13″. 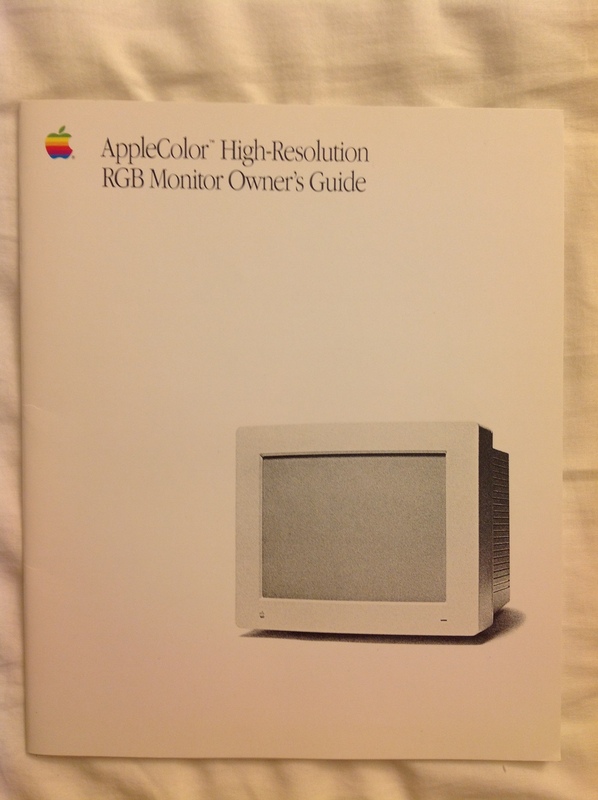 In fact, if you flip over that brochure, there it is, listed as the AppleColor RGB Monitor. For reasons that will become obvious in a moment, the AppleColor RGB fits very nicely on the top of the Quadra 700 when it’s positioned as a desktop rather than a mini-tower. There’s some scratches and scuffs on the monitor but for the most part it works and looks spectacular. This monitor is a classic piece of Snow White era Apple design. My favorite thing about this monitor are the large brightness and contrast dials it has on it’s side. 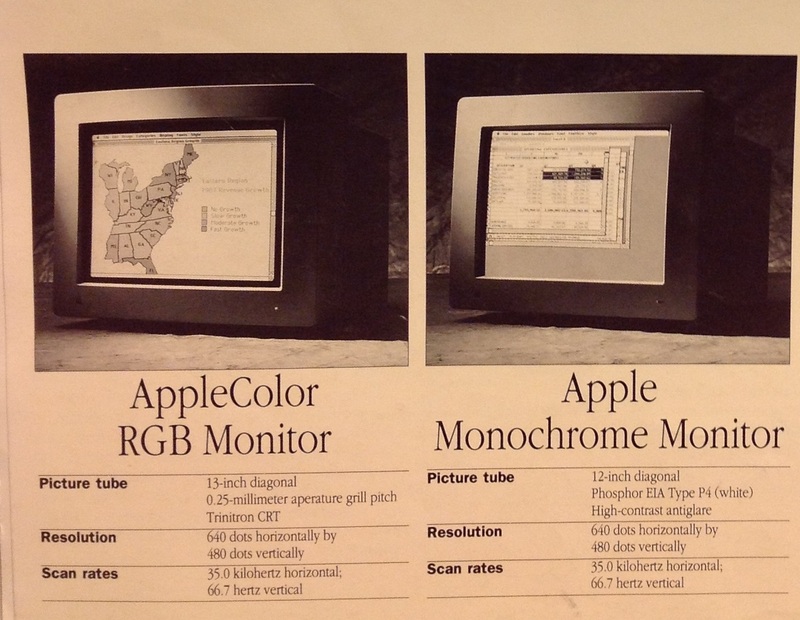 Apple also sold a rather attractive optional base for the AppleColor RGB monitor with great Snow White detailing, as seen in this drawing from Technical Introduction to the Macintosh Family: Second Edition. 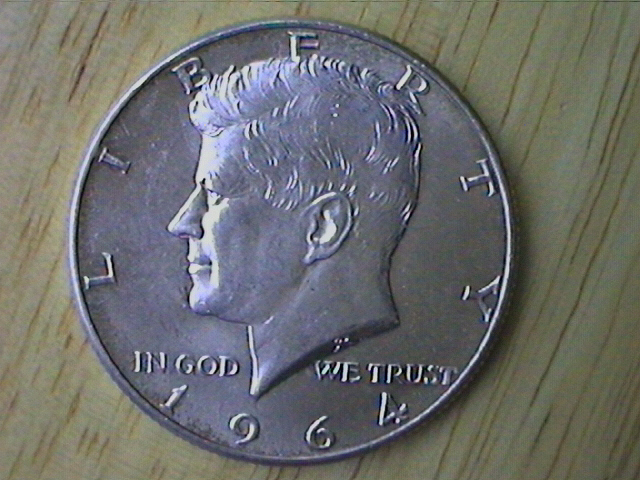 Unfortunately I’ve never seen that base come up on eBay. 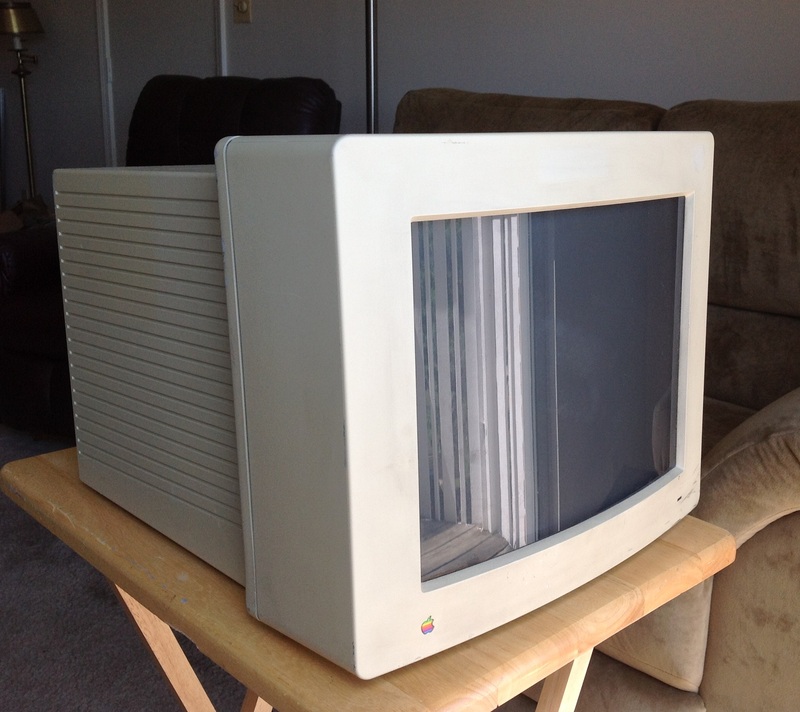 Oddly enough, when I ventured further into my parent’s attic I found a box of Macintosh stuff that a college roommate had recovered from being trashed at a college graphics lab that contained, among other things, the manual for this model of monitor. The Quadra 700 is one of my all-time favorite thrift store finds. It was the first extremely serious Macintosh I have owned from the expandable 680X0 era (roughly from 1987 to 1994 when Apple moved to PowerPC CPUs). 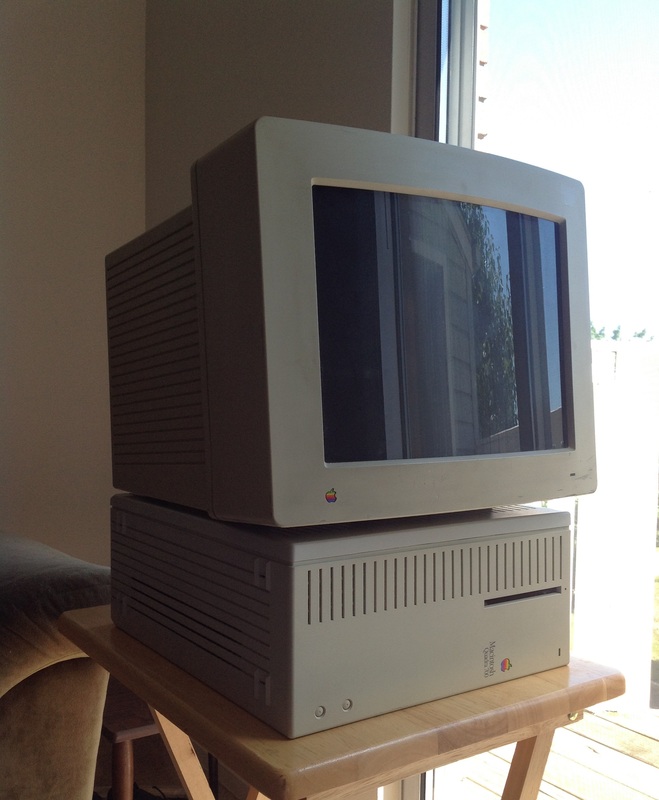 Previously the most powerful Mac I had found was a Macintosh LC III with a color monitor. 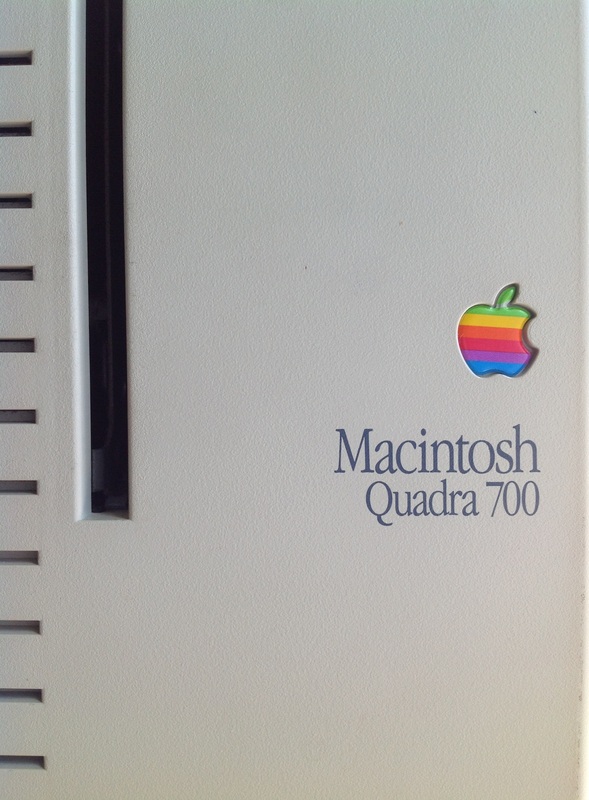 That machine introduced me to what the experience of using a color Macintosh had been like in the early 1990s but the Quadra was on another level entirely. To put this in perspective: Macintosh LC III was a lower-end machine from 1993 that gave you something like the performance of a high-end Macintosh from 1989. 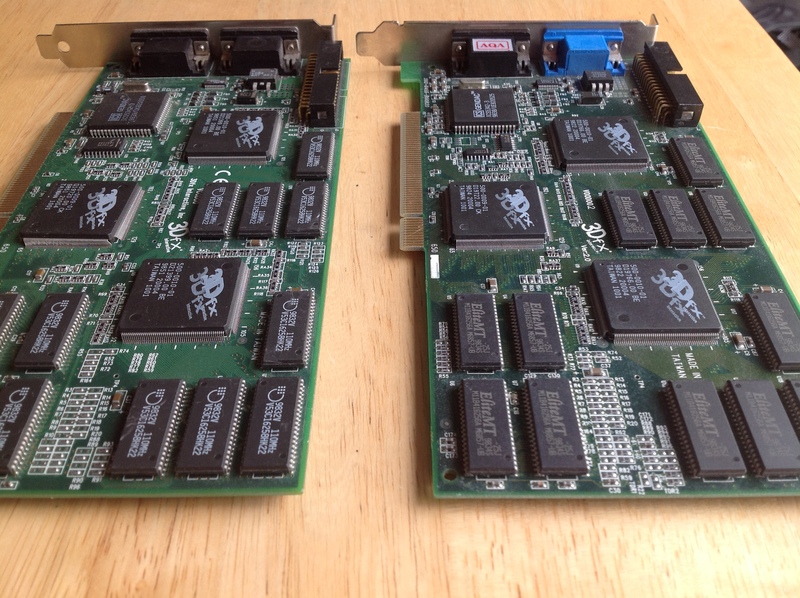 The Quadra 700 (along with the Quadra 900 which was basically the same guts in a larger, more expandable case) was Apple’s late 1991 high-end machine. 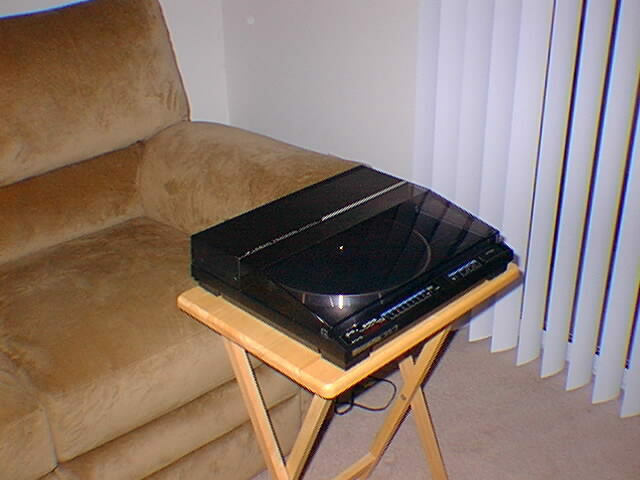 When it was new, the Quadra 700 cost a staggering $5700, without a monitor. The monitor could easily add another $1500. 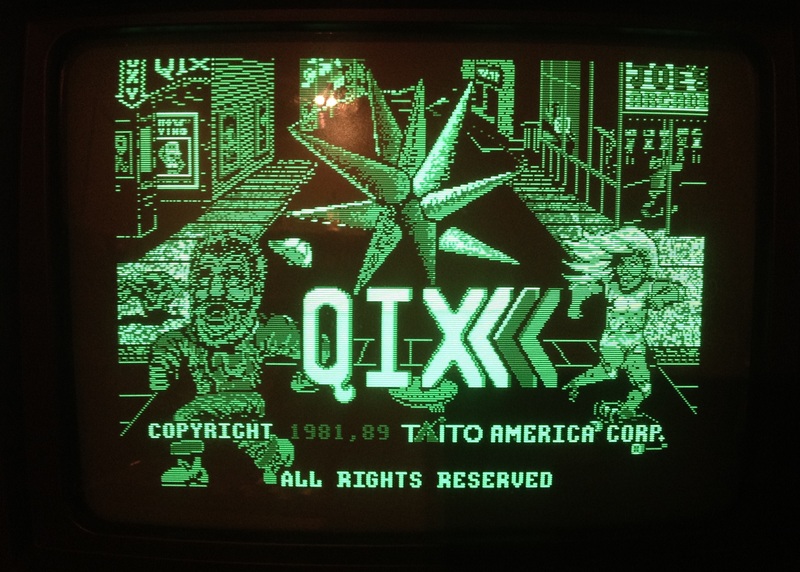 In order to talk about the importance of the Quadra I have to go back to the Macintosh II series, which I also discussed in the Macintosh SE entry. 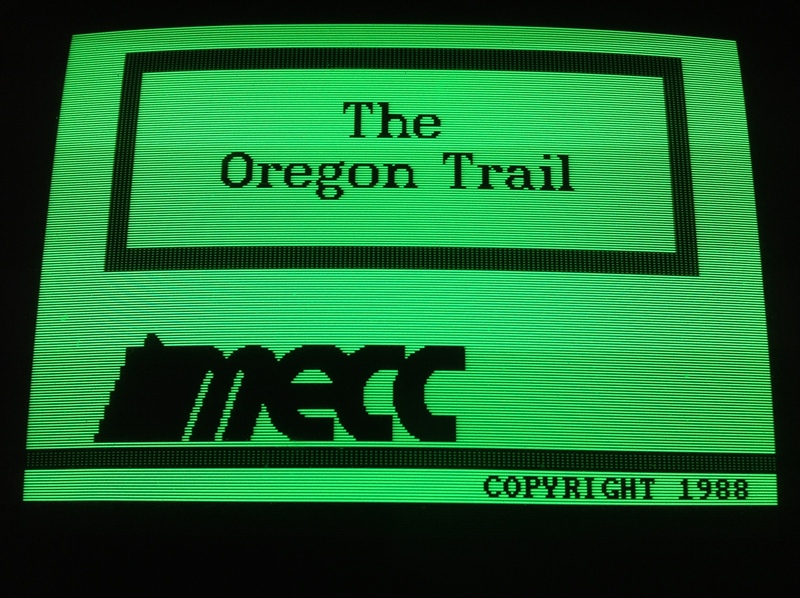 Apple created a lot of machines in the Macintosh II series and it’s a bit difficult to keep track of them. 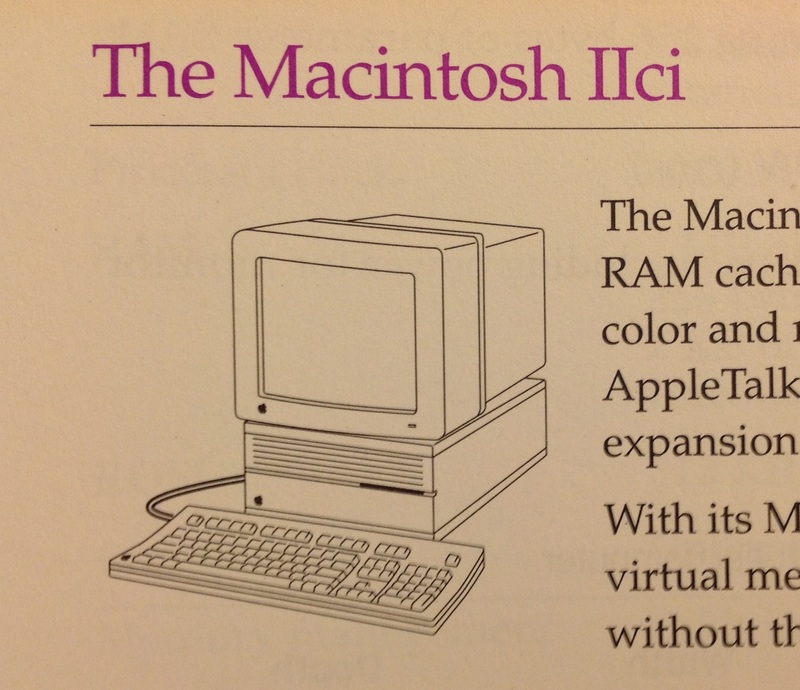 As you can see in the brochure, the original machine was the Macintosh II, built around Motorola’s 68020 processor and for the first time in the Macintosh, a fully 32-bit bus. 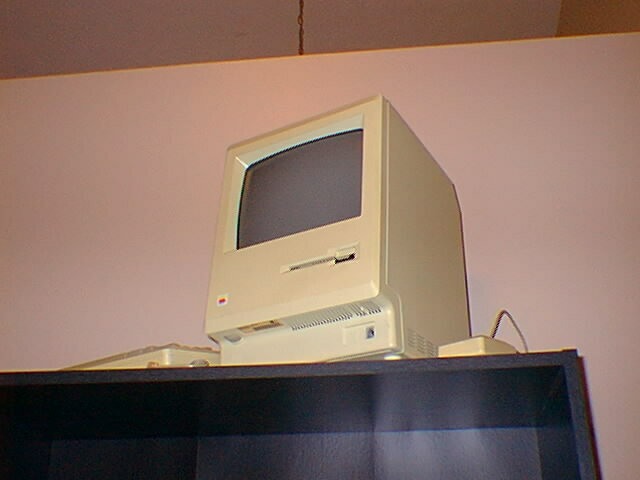 That machine was succeeded the following year by the Macintosh IIx, which, like all following Macintosh II models used the 68030 processor. The II and the IIx both had six NuBus expansion slots, which is why their cases are so wide. 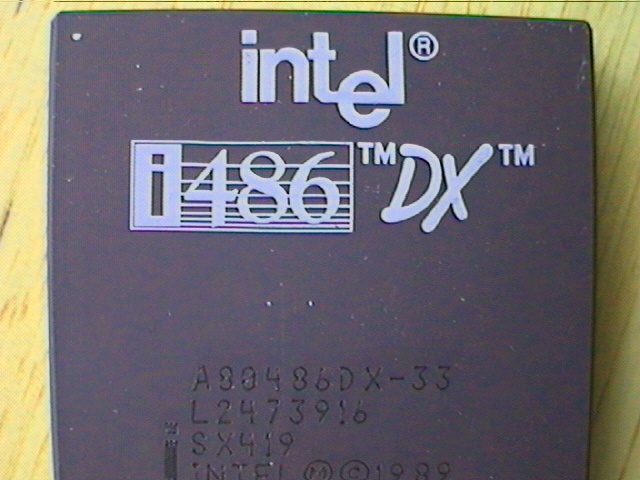 If you’re more familiar with the history of Intel processors don’t let the similar numbering schemes lead you into thinking the 68020 was equivalent to a 286 and the 68030 was equivalent to a 386. In reality the original Macintosh’s 68000 CPU would be more comparable to the 286 while the 68020 and 68030 were comparable to the 386. In the numbering scheme that Motorola was using at the time processors with even numbered digits in their second to last number like the 68000, 68020 and 68040 were new designs and processors with odd numbers like 68010 and 68030 were enhancements to the previous model. 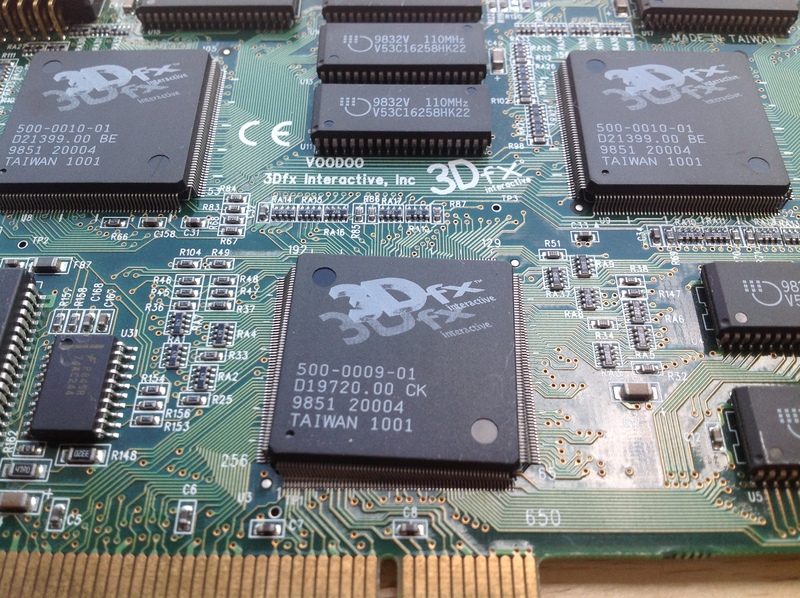 The 68030 gained a memory mapping unit (MMU) which enabled virtual memory. The jump from the 286 to the 386 was much greater than the jump from the 68020 to the 68030. 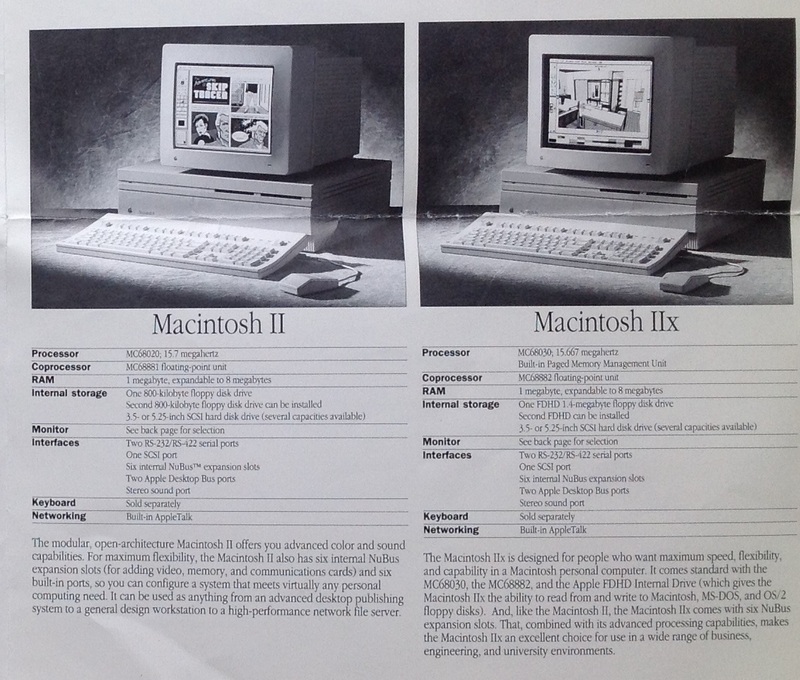 The next machine in the series was the Macintosh IIcx in 1989, which basically took the guts of the IIx and put them in a smaller case with only three expansion slots (hence, it’s a II-compact-x). 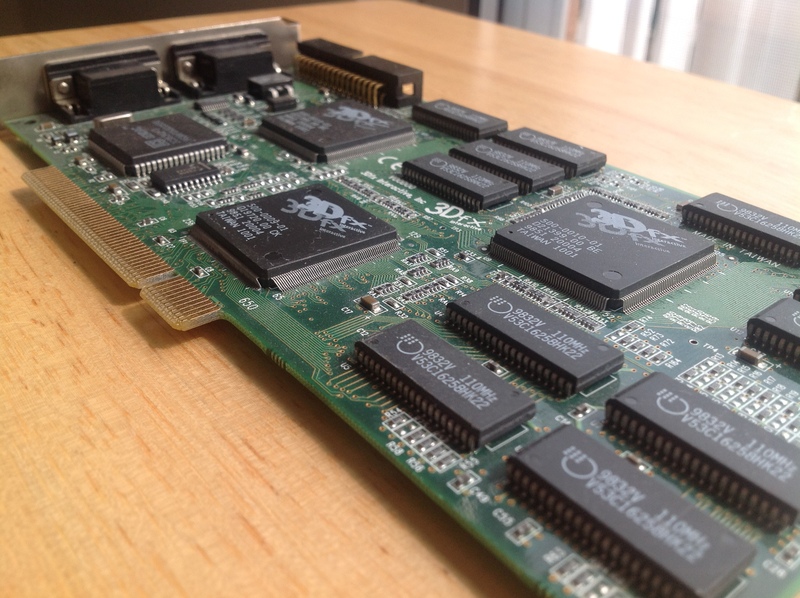 Like the II and the IIx, the IIcx had no on-board video and required a video card to be in one of the expansion slots. 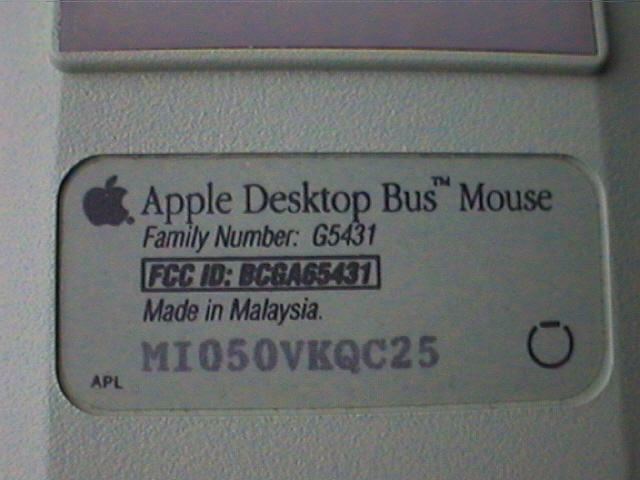 Later that year Apple reused the same case for the Macintosh IIci, which added on-board video. 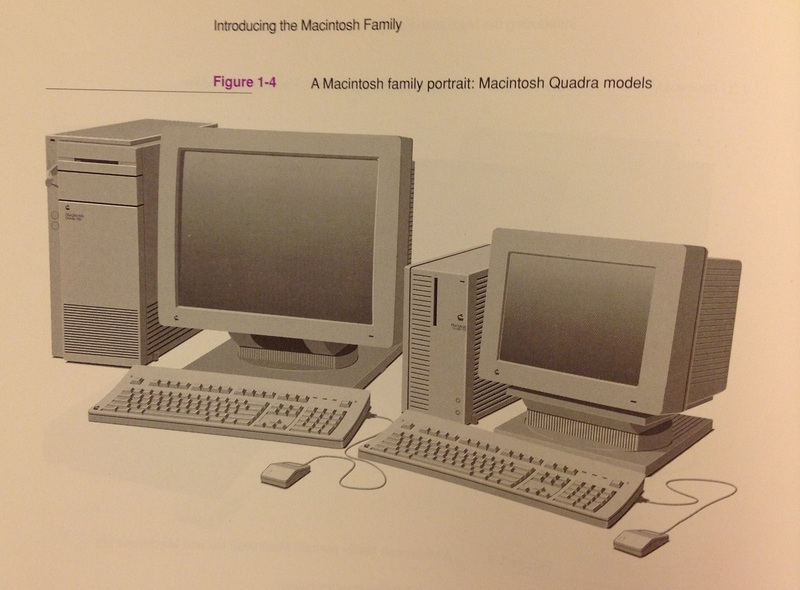 The case used in the Macintosh IIcx and IIci was designed to match in color, styling, and size the AppleColor High Resolution RGB monitor I have, as seen in this illustration from Technical Introduction to the Macintosh Family: Second Edition. 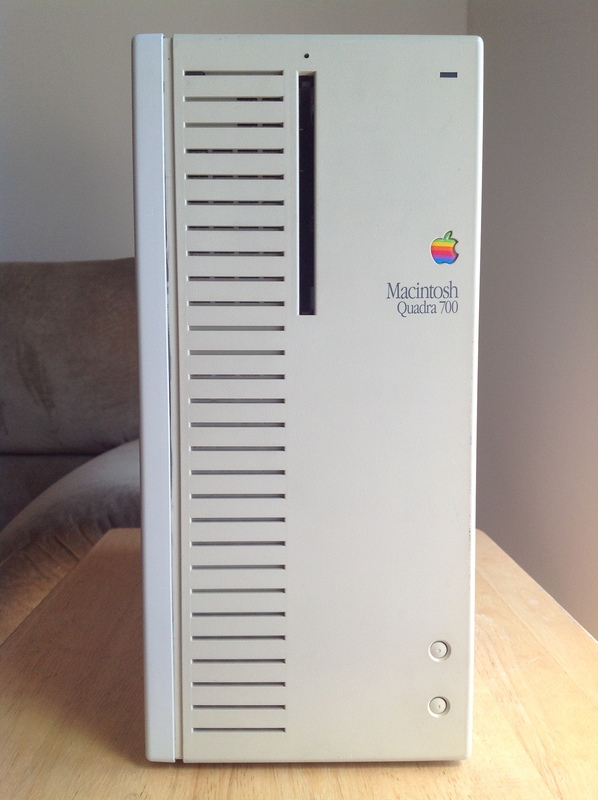 As you probably caught onto by now the Quadra 700 uses the same case as the Macintosh IIci but with the Snow White detail lines and the Apple badge turned 90 degrees, turning it into a mini-tower. That’s why the monitor matches the Quadra so well. 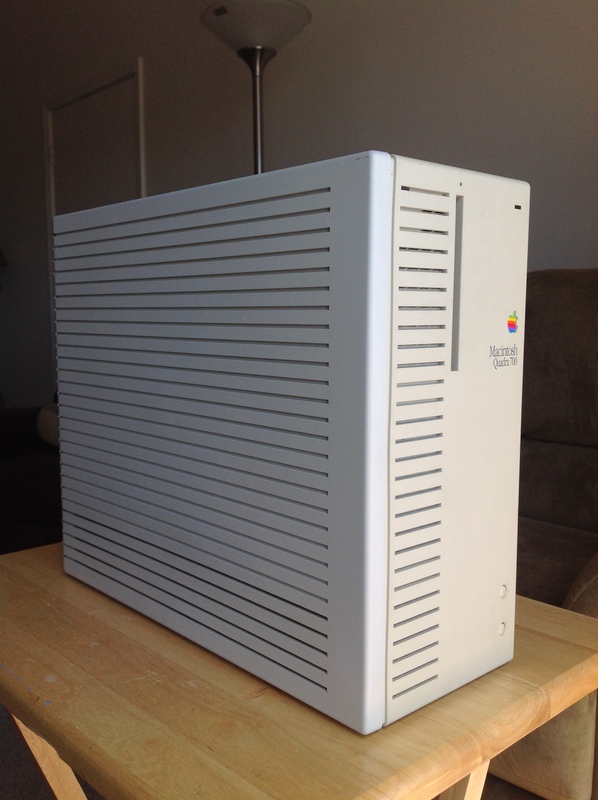 The last Macintosh to use the full-sized six-slot Macintosh II case was the uber-expensive Macintosh IIfx in 1990. 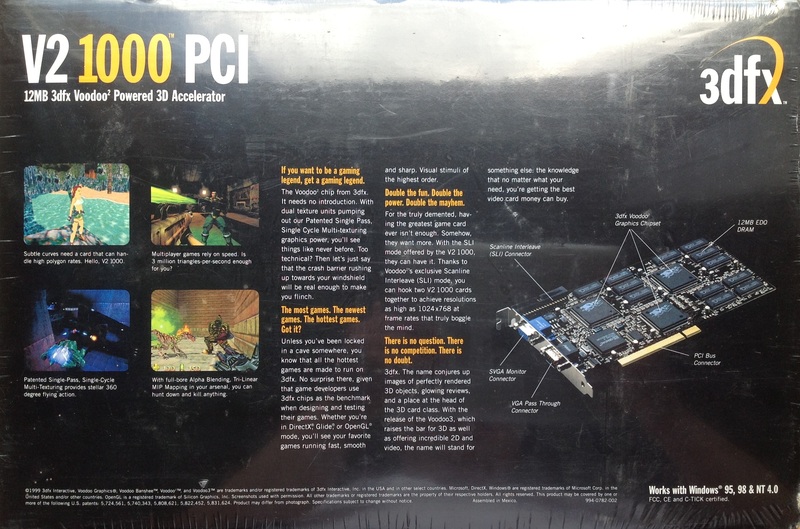 It used a blistering 40MHz 68030 and started at $8970. However, if you bought a IIfx, you may have felt very silly the next year when the Quadra series based on the new 68040 processor came out and succeeded the Macintosh II series. 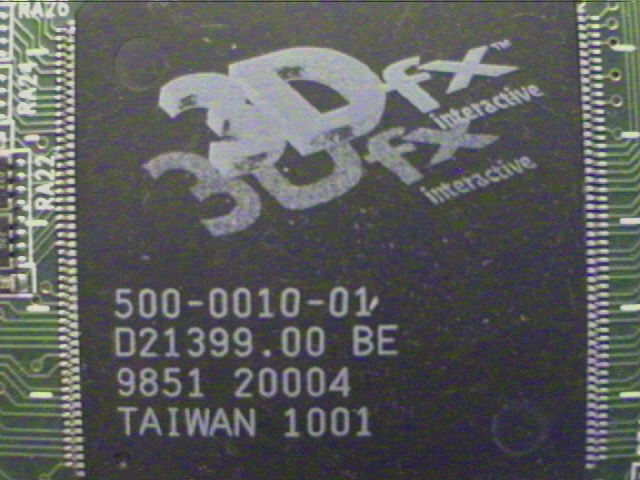 The 68040, especially the full version of the chip with the FPU (floating point unit) that the Quadra 700 used, was a huge jump in processing power. According to these benchmarks at Low End Mac, the 25MHz 68040 in the Quadra 700 scores 33% higher than the Macintosh IIfx’s 40MHz 68030 on an integer benchmark and five times as fast on a math benchmark. Plus, it was just over half the price of the IIfx. The interior of the Quadra 700 is extremely tidy. The question the hardware designers at Apple were clearly working with was: what is the most efficient case layout if you need to pack a power supply, a hard disk, 3.5″ floppy drive, and 2 full-length expansion slots in a case? In the Quadra 700 the two drives are at the front of the right side of the case, the PSU is at the back of the right side, and the two expansion slots take up the left side of the case. 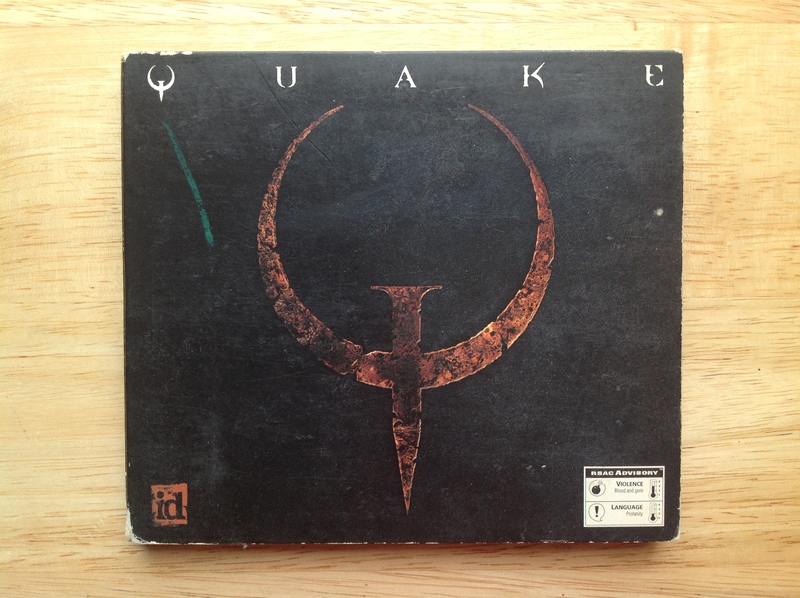 You can tell how the arrival of CD-ROM drives threw a wrench in all of this serene order. 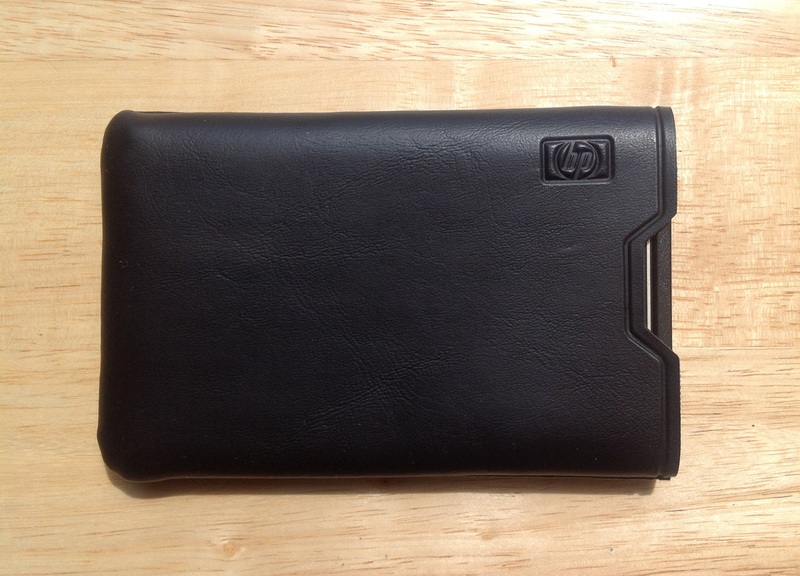 You’re never going to shoe-horn a 5.25″ optical drive in this case. 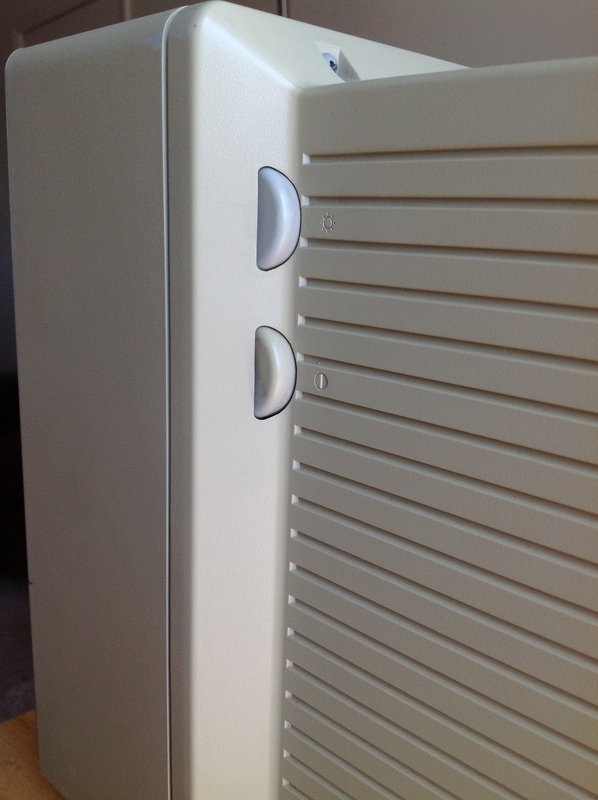 And when you do get a CD drive in the case you’re going to have an ugly looking gap for the drive door rather than just the understated slot for the floppy. I think Apple’s designs lost a lot of their minimalist beauty when they started putting CD drives in Macintoshes soon after the Quadra 700. Inside the case, the way everything is attached without screws is very impressive. 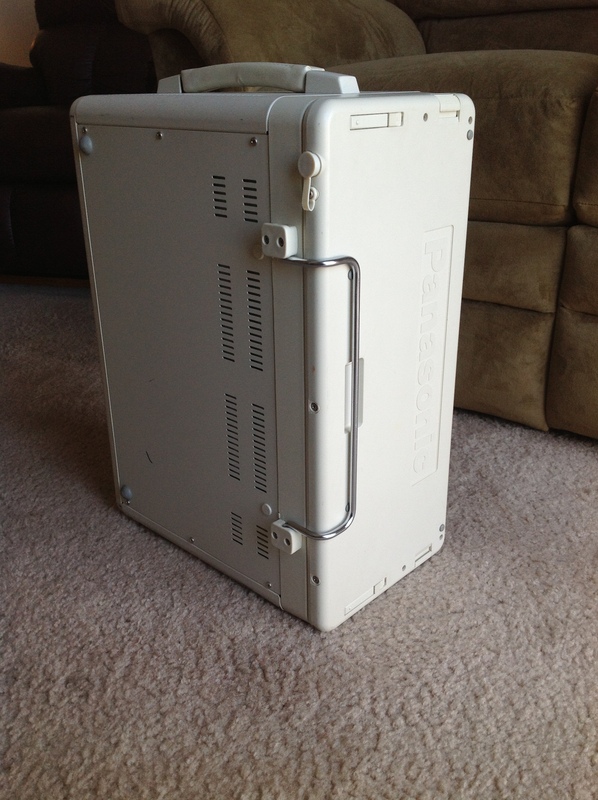 The sides of the case and the cage that hold the drives forms a channel that the PSU slides into. Assuming nothing is stuck you should be able to pull out the PSU, detach the drive cables, and then pull out the drive cage in a few short minutes without using a screwdriver (actually, there’s supposed to be a screw securing the drive cage to the logic board but it was missing in mine with no ill effects). We tend to think of plastic in the pejorative. 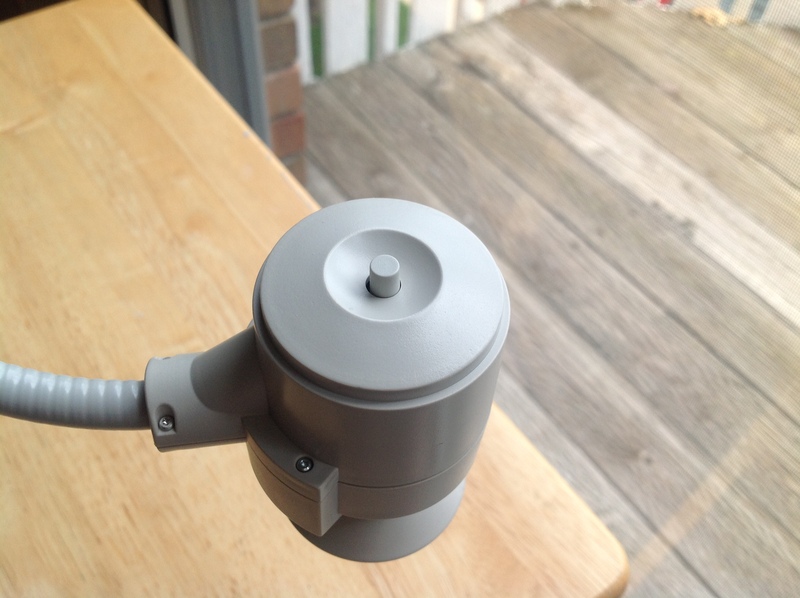 But, plastic is only cheap and flimsy when it’s badly done. This Quadra’s case is plastic done really, really well. It doesn’t flex or bend. It’s rock solid. 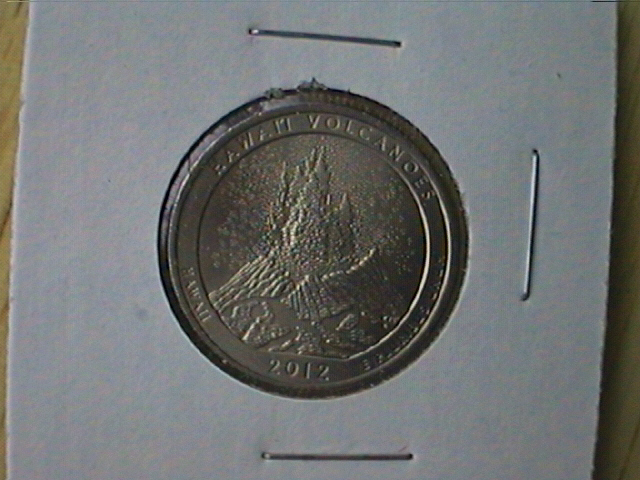 But, when you pick the machine up it’s much lighter than you expect it to be. 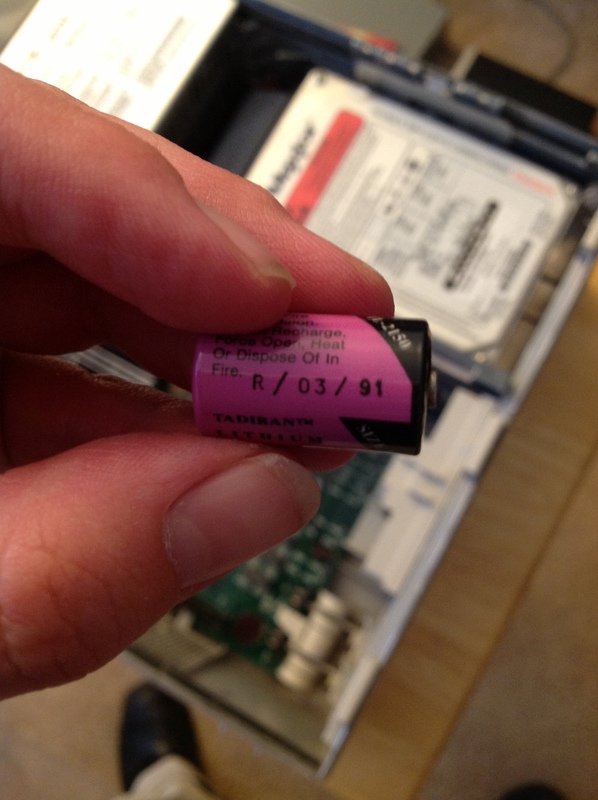 Recently, I needed to replace the Quadra 700’s PRAM battery, which apparently dated from 1991. The battery is located under the drive cage so this was a nice opportunity to remove the power supply and drive cage to see the whole board. The new battery is white, located in the bottom right hand corner. Looking at the whole board there are two really interesting things to note here. First the logic board itself is attached to the rest of the plastic case using plastic slats and hold-downs. Had I wanted to remove the logic board and I knew what I was doing, I could probably do that in a few minutes. Second, notice the six empty RAM slots. Curiously enough, on the Quadra 700 the shorter memory slots just above the battery are the main RAM. 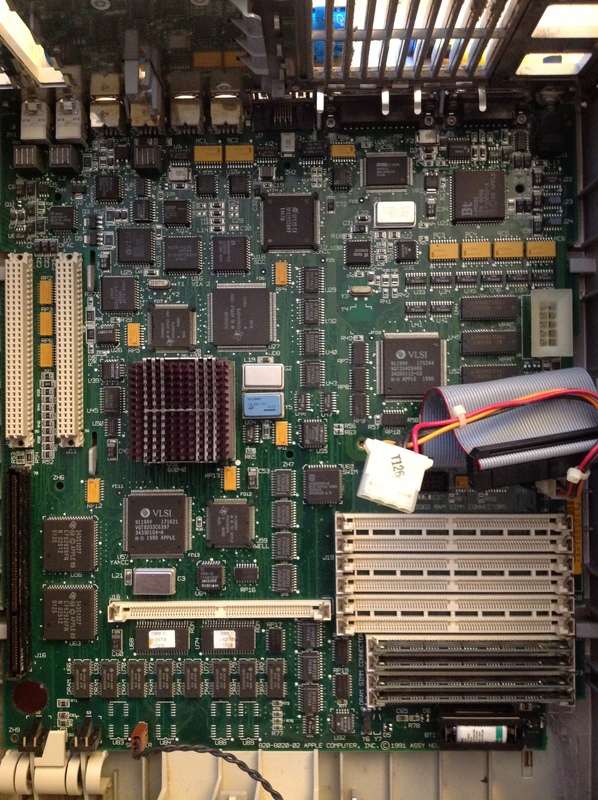 I believe this machine has four 4MB SIMMs in addition to 4MB RAM soldered onto the logic board (the neat horizontal row of chips labeled DRAM to the left of the SIMMs on the bottom of the picture) The larger white empty slots are for VRAM expansion. 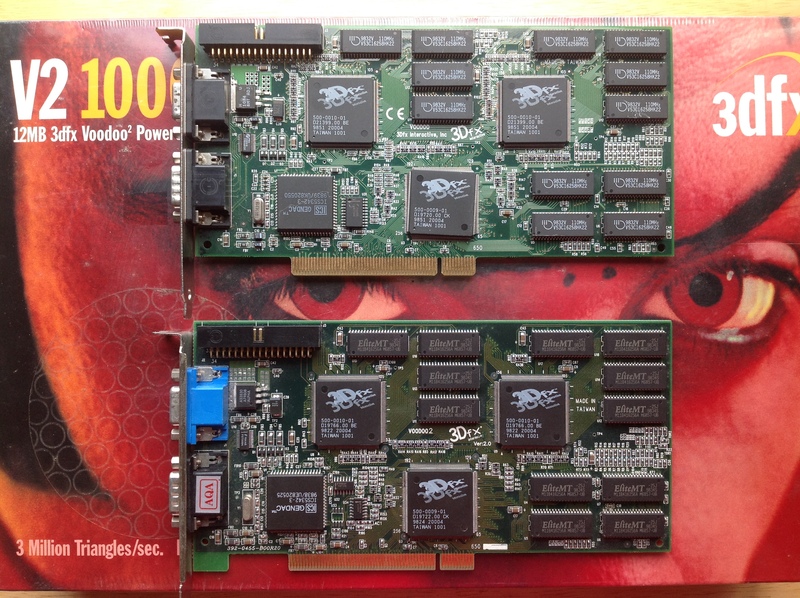 You can tell from this series of articles (that I assume were posted on newsgroups back in 1991) written by one of the Quadra 700’s designers how proud they were about the video capabilities of the Quadra 700 and 900. The way the video hardware talks to the CPU makes it really, really fast compared to previous Macintoshes with built-in video and even expensive video cards for the Macintosh II series. 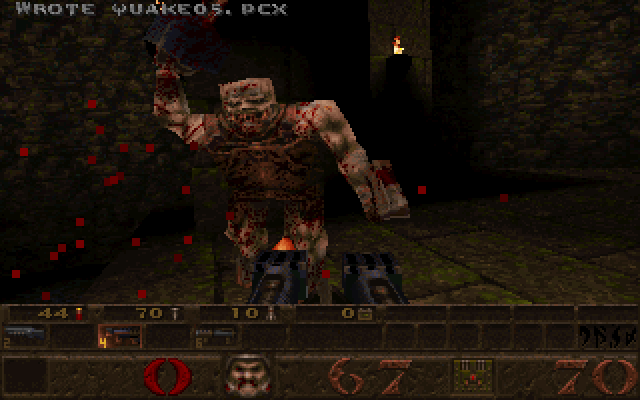 The Quadra’s video hardware supports a wide variety of common resolutions and refresh rates including VGA’s 640×480 and SVGA’s 800×600. That’s why I can use the Quadra with that VGA adapter pictured above. 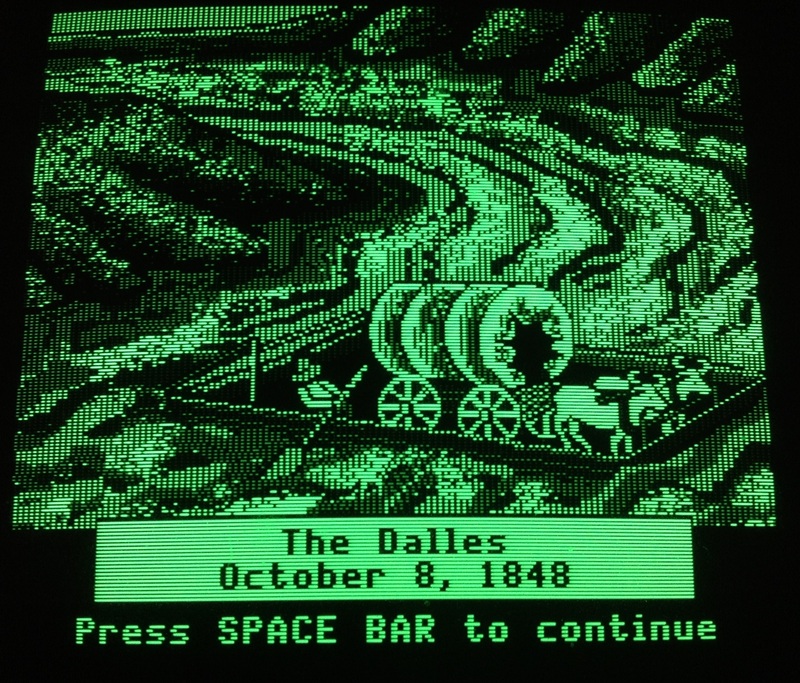 This was neat stuff in an era when Macintoshes tended to be very proprietary. 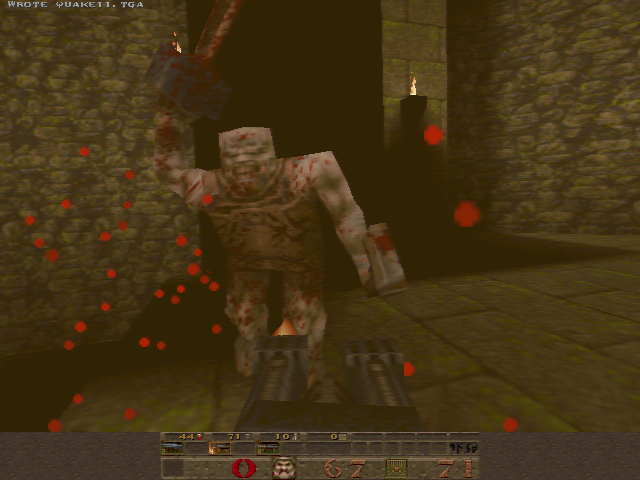 If you fully populate the VRAM slots (which gives you a total of 2MB VRAM) you can use 32 bit color at 800×600. Point 3 just blows me away. 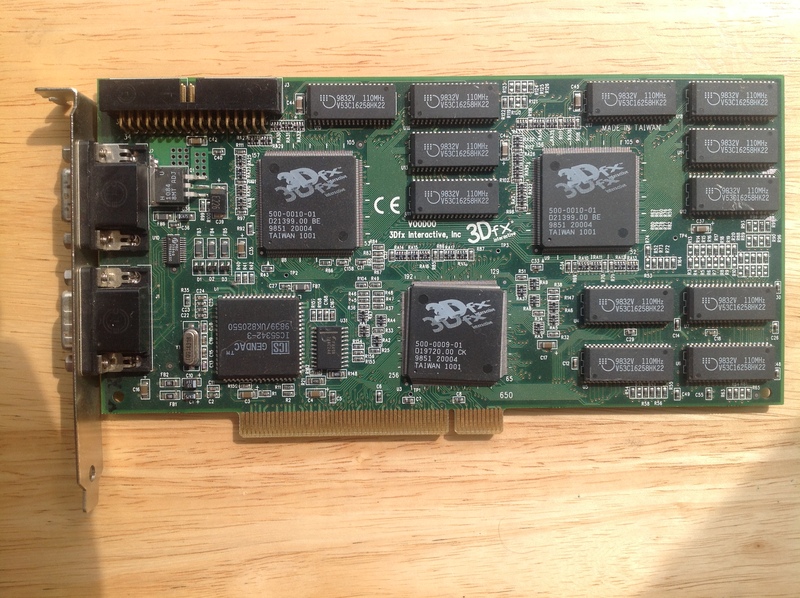 To put that in perspective, the Matrox Mystique card that my family bought in 1997 or so had 2MB VRAM and did 800x600x32-bit color. 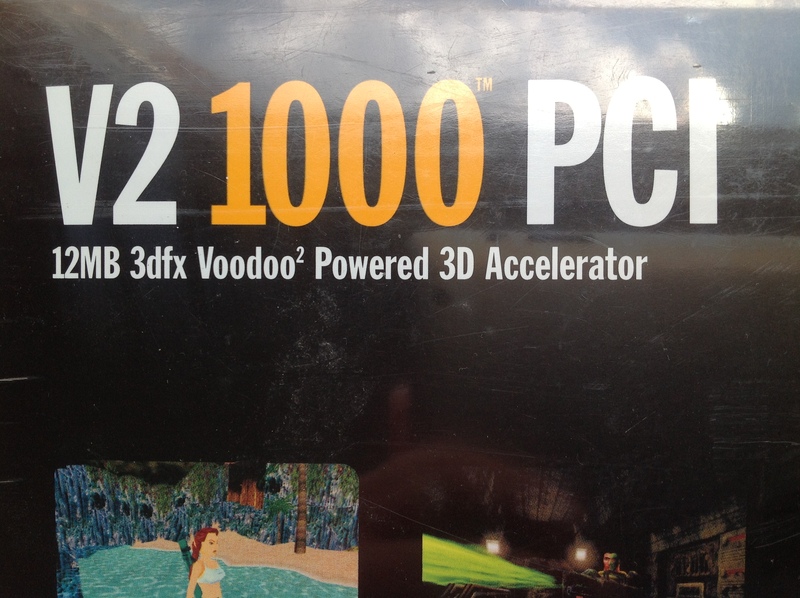 There’s a good reason the Quadra 700 was so outrageously expensive. If you were a graphics professional and you needed true color graphics, Apple would gladly make that happen for the right price. 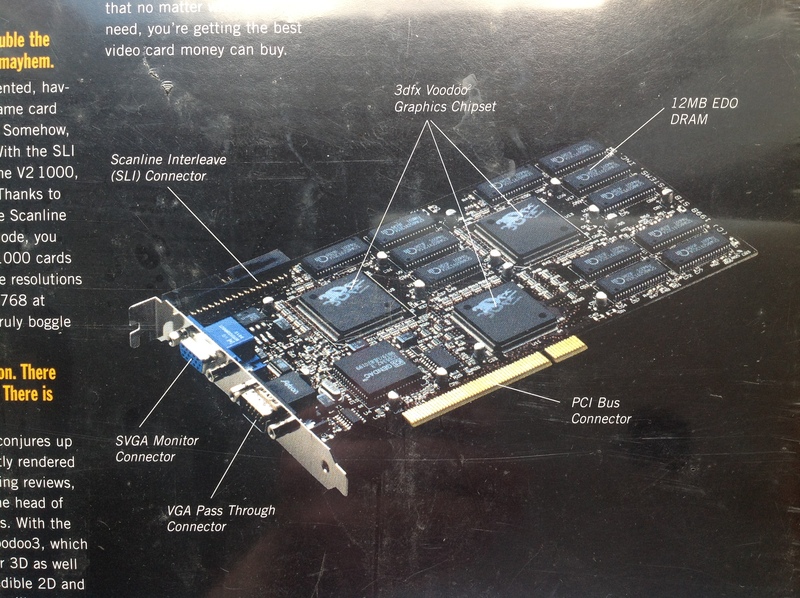 There is a person on eBay selling the VRAM SIMMs that the Quadra uses. It would probably cost me about $50 to populate those RAM slots. It’s very tempting. I’m planning on doing another entry on the Quadra 700 sometime in the future to talk about what actually using this machine is like. 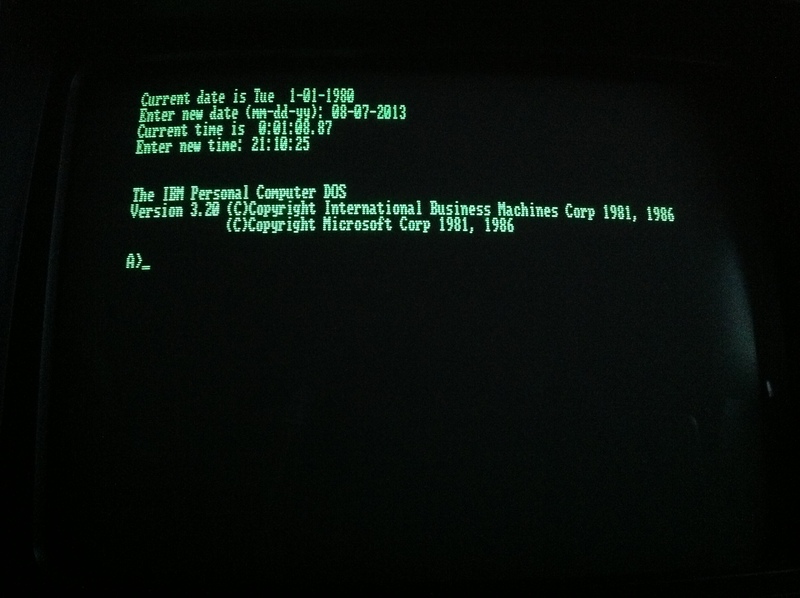 This is my Commodore 1084 monitor, which I believe was made sometime around 1987. About two years ago an aunt and uncle that live nearby heard that I was looking for old computers and offered me my uncle’s first computer. 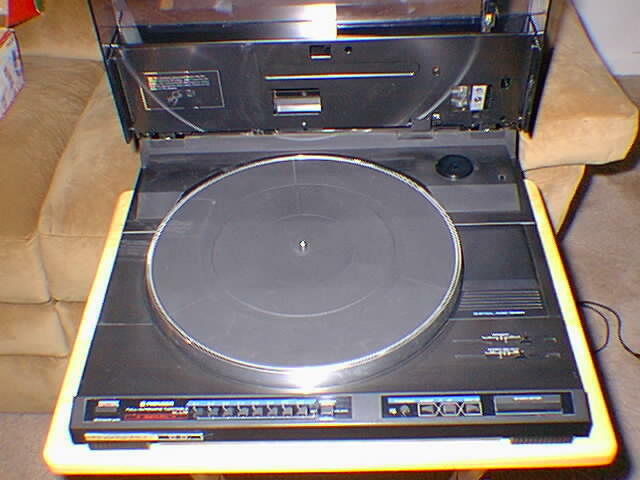 When we got it out of their basement I found that he was giving me a Mitsuba-badged XT clone, as well as the monitor that had remained attached to it for over 20 years. 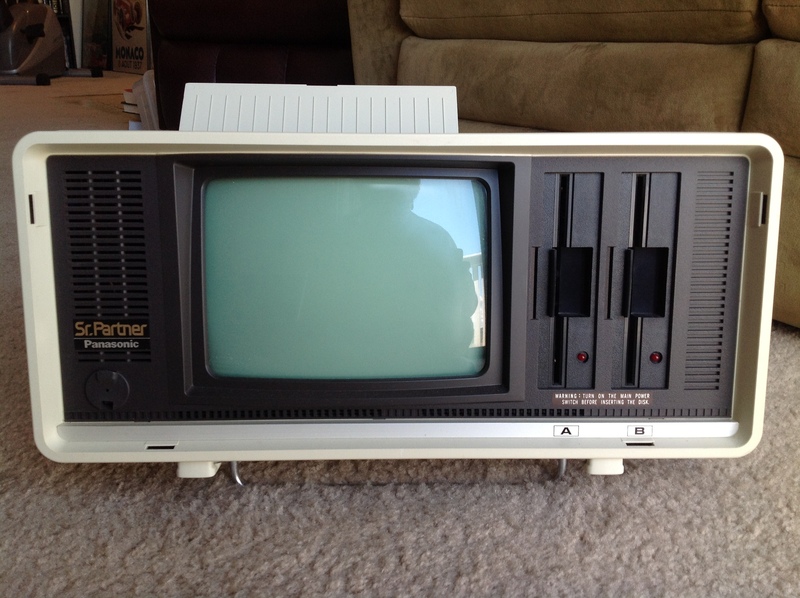 I was kind of shocked to find out the monitor was a Commodore! That was not a name I expected to see on a monitor connected to a PC. 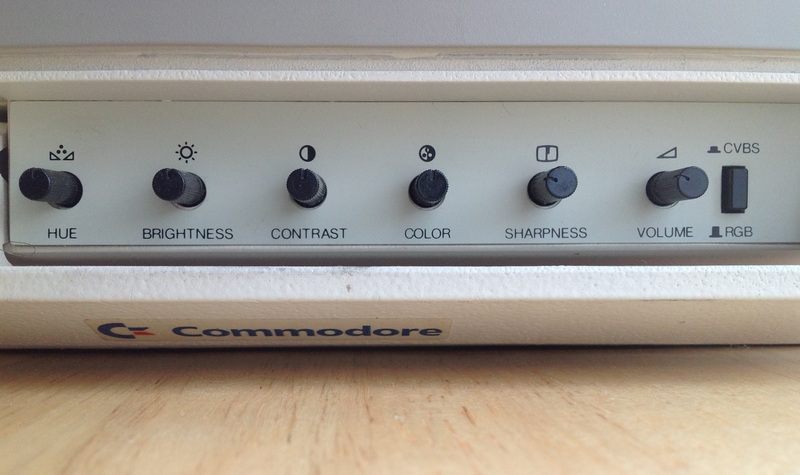 The Commodore 1084 is an unassuming looking thing. I have to admit when my uncle first pulled it out of his basement, I was a little disappointed. 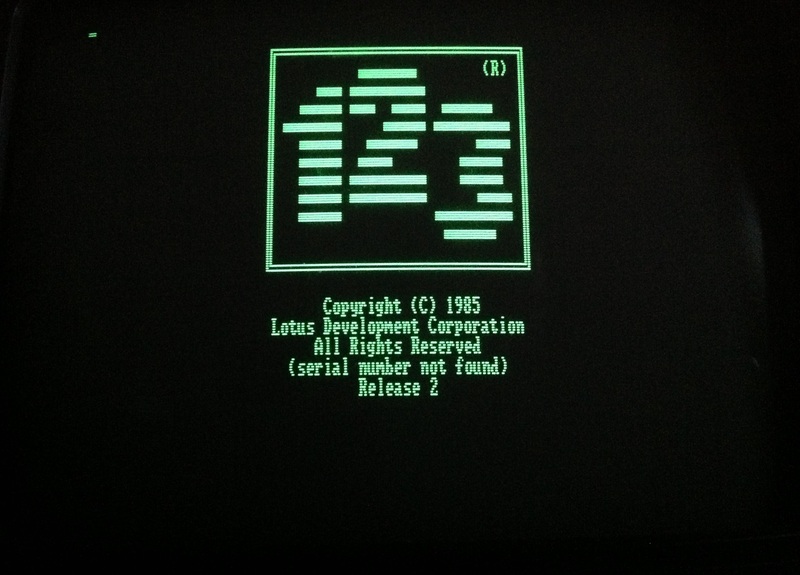 I was hoping to see something really cool like an IBM 5130 Personal Computer Color Display Monitor. 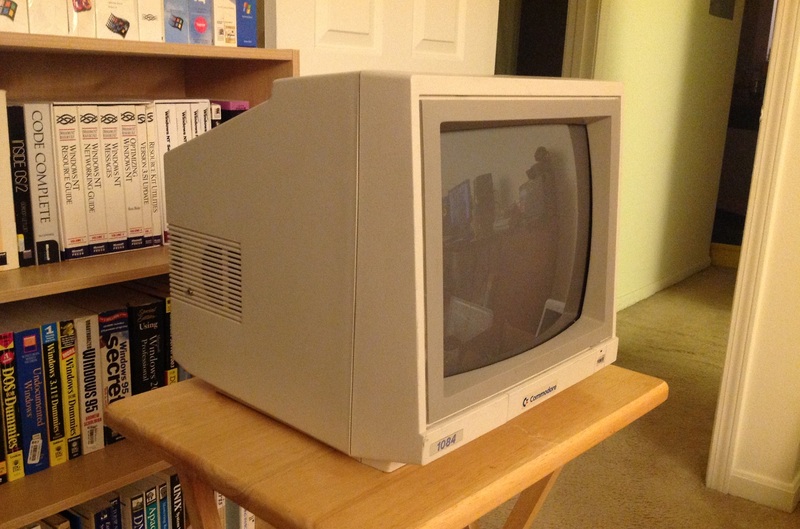 The Commodore 1084, on the other hand looks like any one of a myriad of generic composite monitors you may have seen in the 1980s or come upon in a school that kept it’s Apple IIs well into the 1990s. Oh how wrong I was to be disappointed about the 1084. 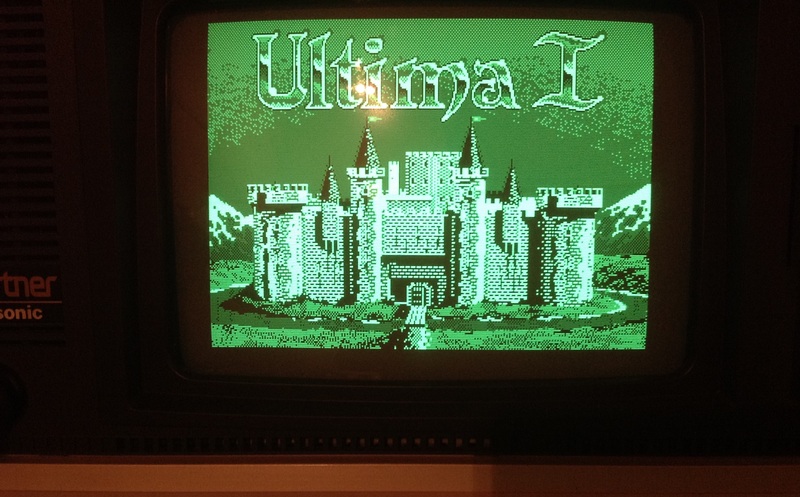 From what I gather this is actually a legendary monitor among Commodore aficionados. It looks remarkably generic looking until you look at the connections on the back. 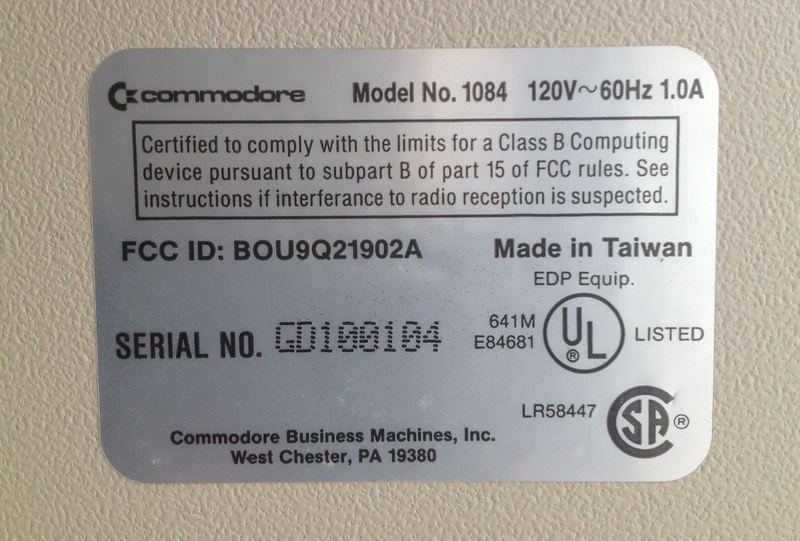 What makes the Commodore 1084 legendary? Let’s take a closer look at those video connections on the left. 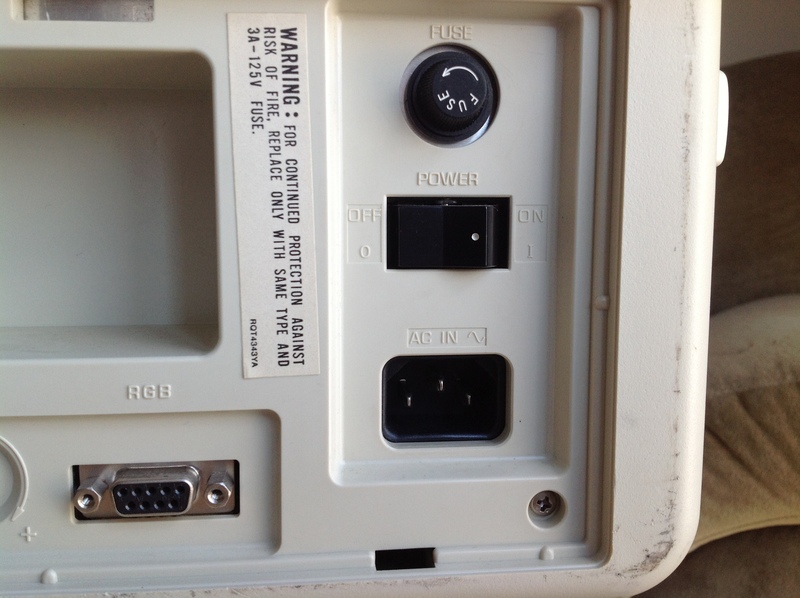 At first glance that looks like a standard cluster of a yellow composite video RCA input and two white and red RCA audio inputs next to two strange and proprietary DIN connectors. But that’s wrong. The little switch to the left that’s labeled CVBS and LCA clues you into the real story. 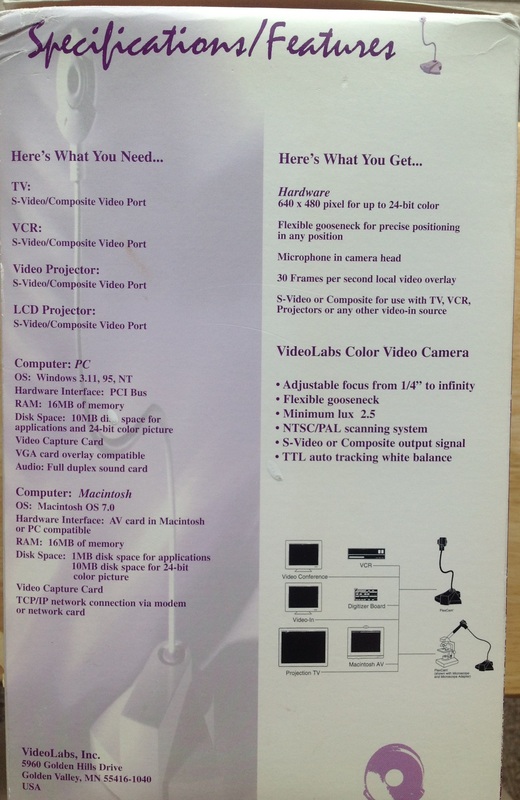 Several of Commodore’s products such as the Commodore 64 supported a video signal that used two RCA connectors for Luminance (aka Luma) and Chroma. 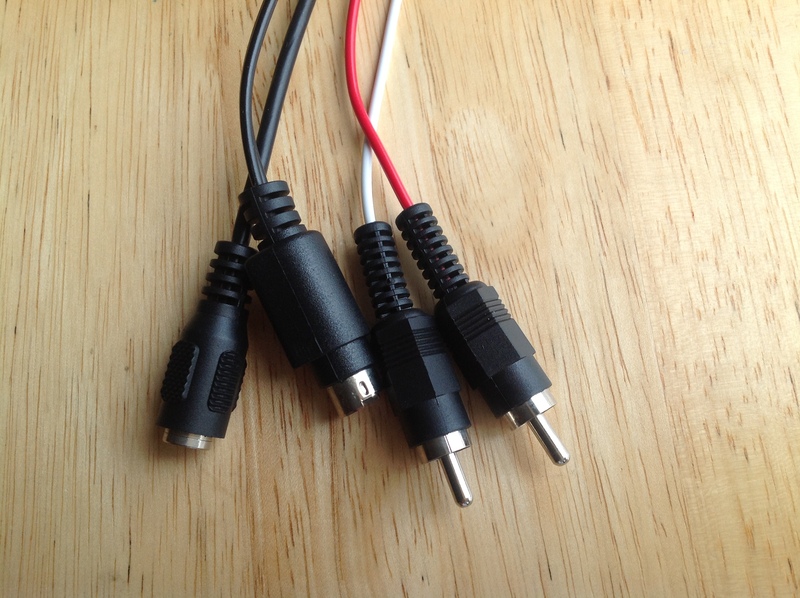 This is electrically identical to S-Video, which uses a more familiar small DIN connector. LCA stands for Luma, Chroma, and Audio. When the little switch is in the up position the yellow plug is for Luma and the Red plug is for Chroma. The 1084 has an amplifier and a generous speaker built into it’s left side so the white connector is a standard mono audio input. 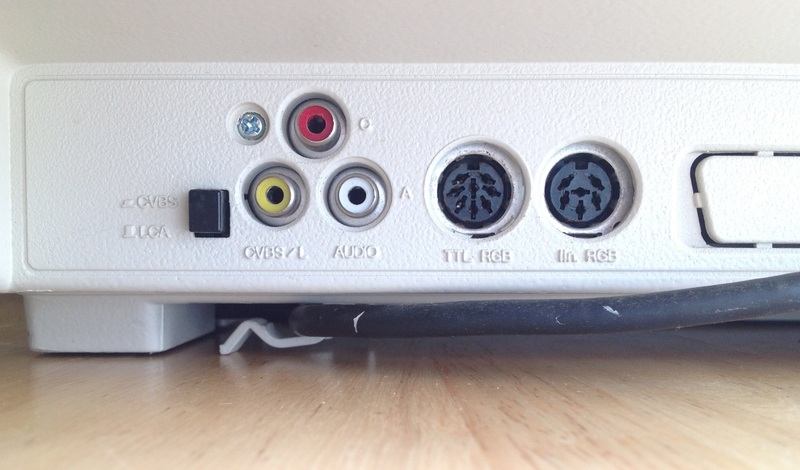 When the switch is in the down position the yellow becomes a standard composite video input and the white input is used for mono audio. 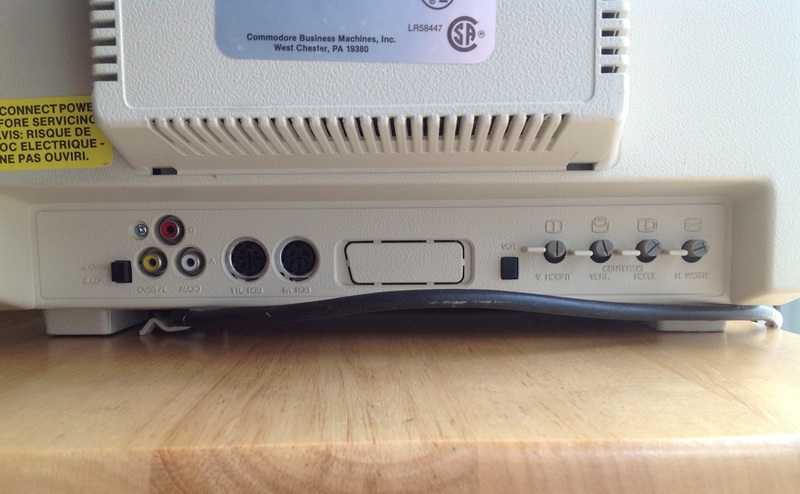 So, just in that cluster of three RCA plugs we can see that the monitor supports two major video standards of the time: composite and S-Video. That’s already much more interesting than one of those generic composite monitors. So what’s TTL RGB? 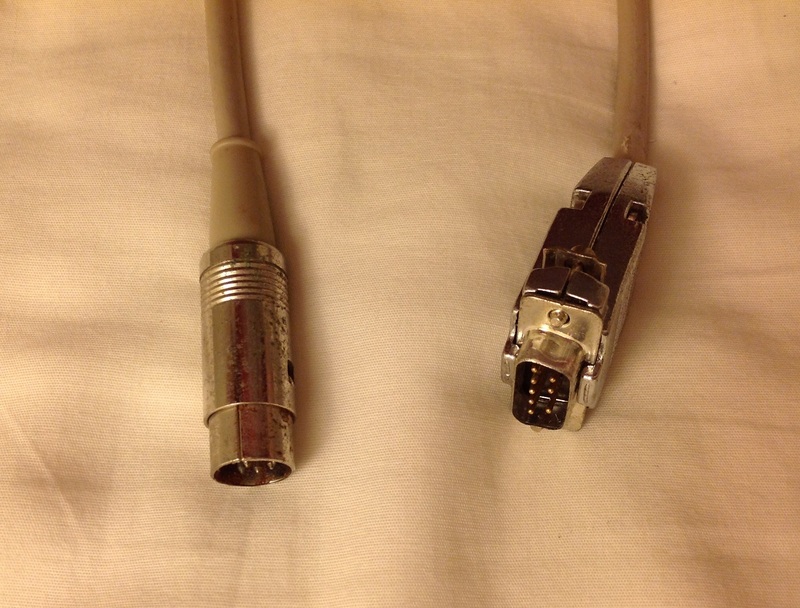 That’s what my uncle had his PC plugged into, via an adapter cable that went from the DB-9 CGA connector to the DIN connector on the 1084. 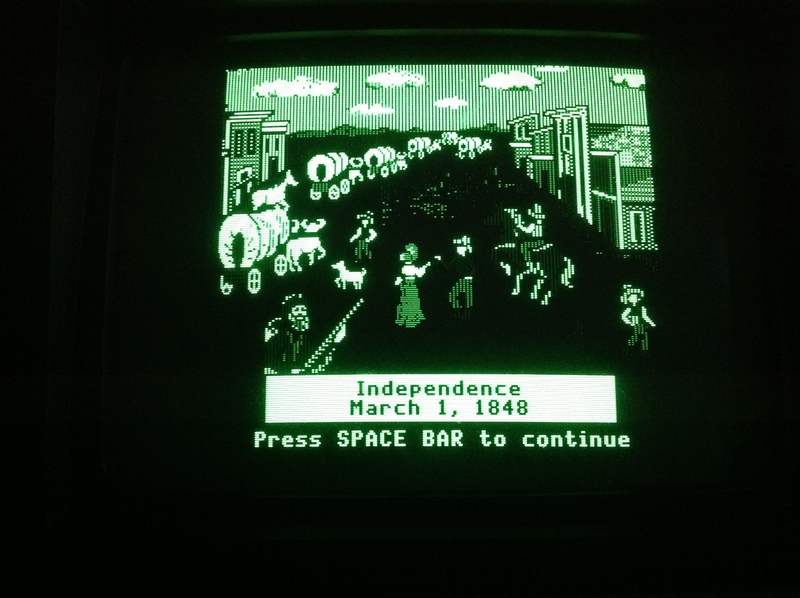 Yes, this monitor supports CGA (and by extension, some EGA modes). 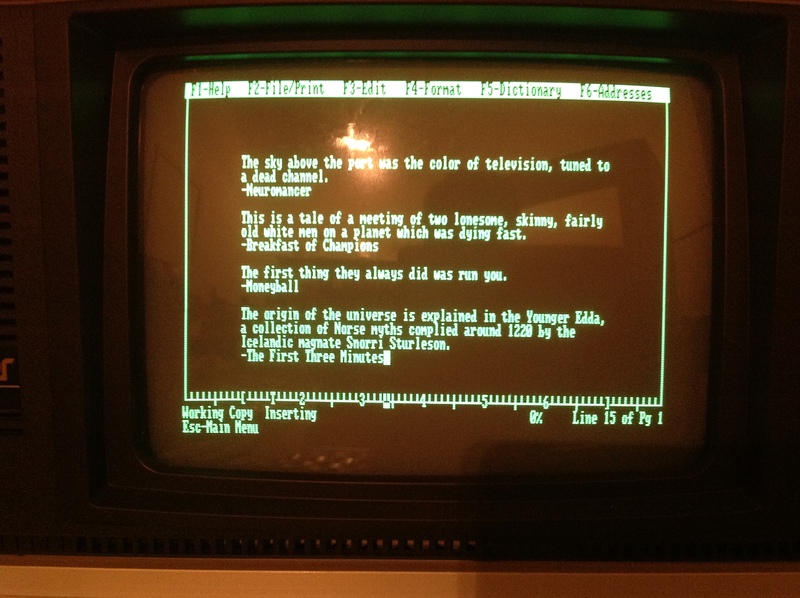 That’s interesting because unlike the analog VGA we’re all very familiar with, CGA basically sent very primitive digital signals to a monitor where, for example, the Red channel was either ON or OFF (rather than a varying intensity) depending on the color that was being sent. 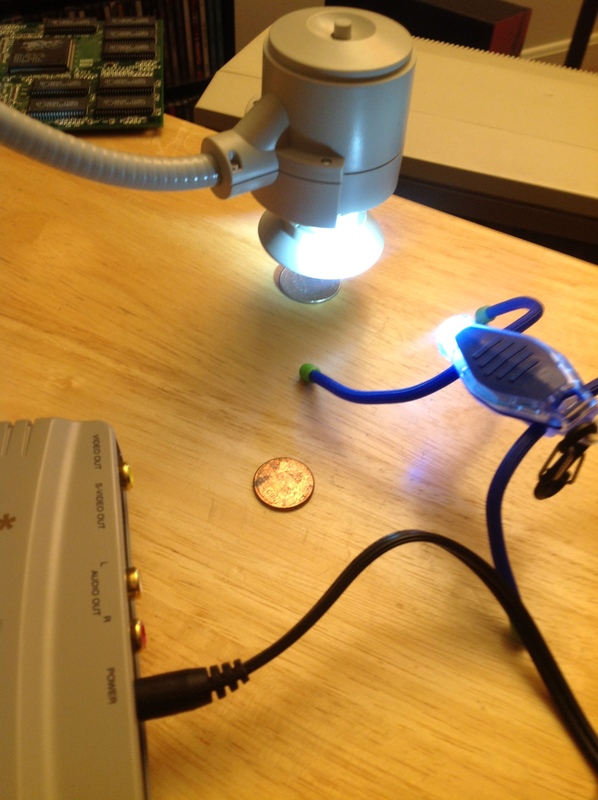 There have to be guts inside of the monitor to turn the TTL signals into video. 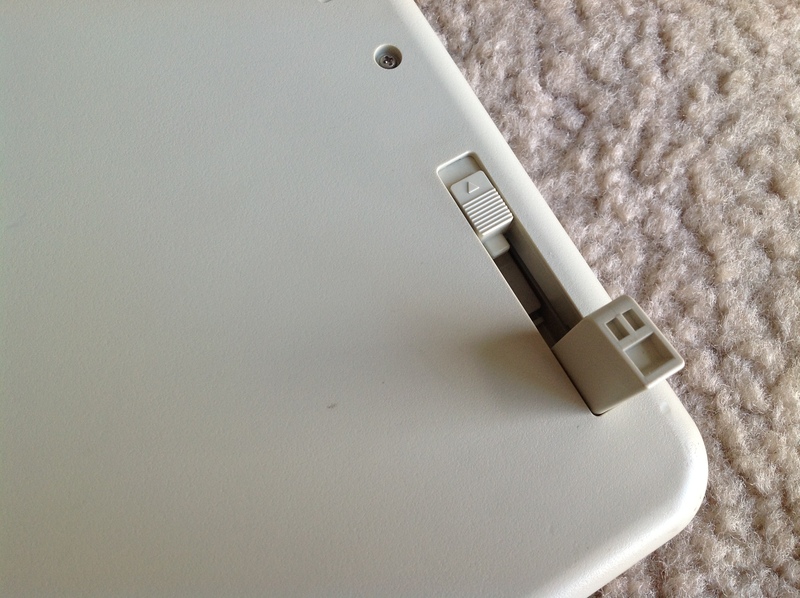 The second DIN connector is apparently for Linear RGB, which was an analog RGB standard supported on the Amiga, though, I don’t have an Amiga available to test that. One of the controls on the front panel switches between the RGB DIN inputs at the RCA composite/S-Video inputs. If you want to use composite, the front switch must be in CVBS and the rear switch must be in CVBS. 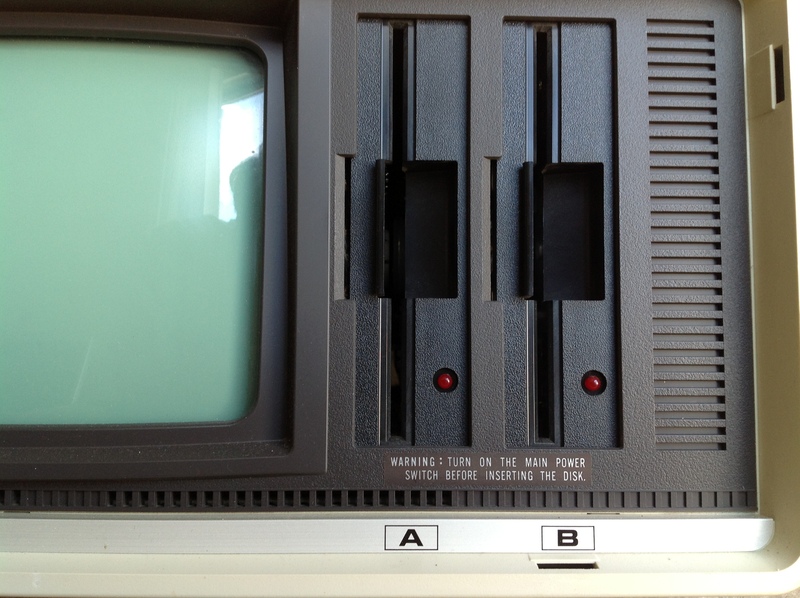 If you want to use S-Video, the front switch stays in CVBS and the rear switch is set to LCA. 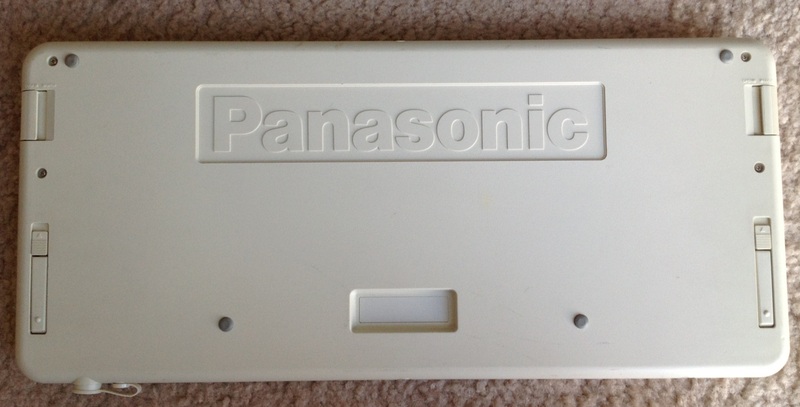 If you want to use the TTL RGB for CGA, the front switch just needs to be in RGB. That seems a bit kludgy but you get used to it. So, what is fascinating to me is that this unassuming monitor supports at least four of the major video standards of the time (and maybe more because I see some discussion that there was an adapter make the Apple IIgs work with the 1084). This makes sense because in this time period Commodore was selling Commodore 64s, Amigas, and PC clones and it was sensible for them to have a single monitor that worked with all of their products. I’ve been spending a lot of time researching Apple products of the 1980s and this sort of blows my mind. 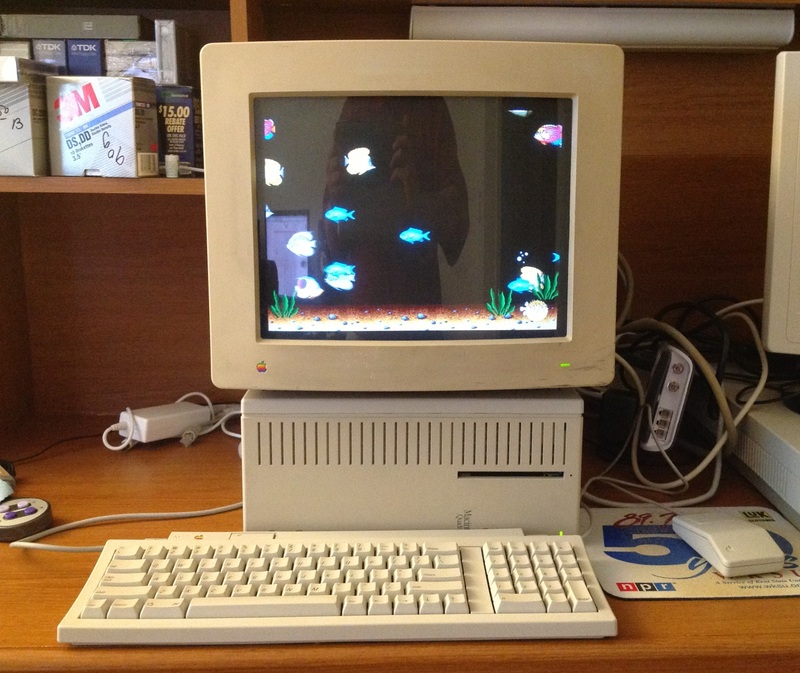 At the same time as Commodore was selling the 1084 Apple had several video standards going for the Macintosh, Apple IIgs, and Apple IIe/Apple IIc and did not sell a single monitor that worked across their whole product line. 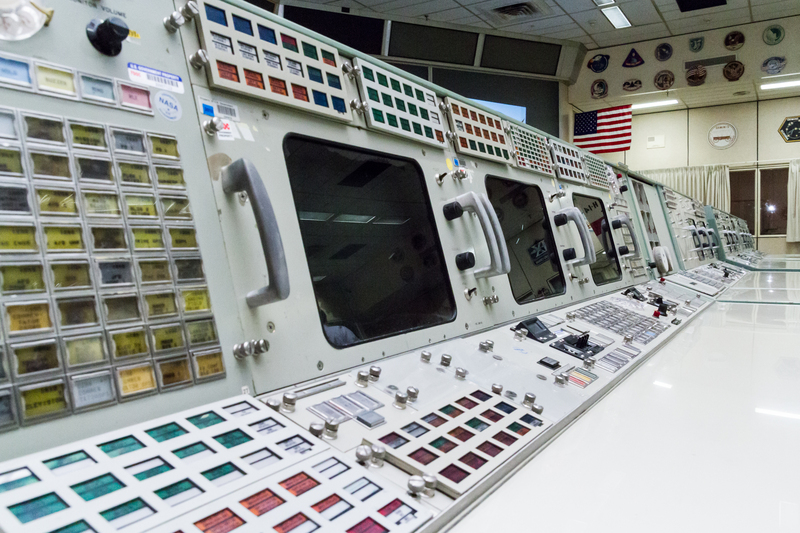 Now, to be fair, this is not a multisync monitor. 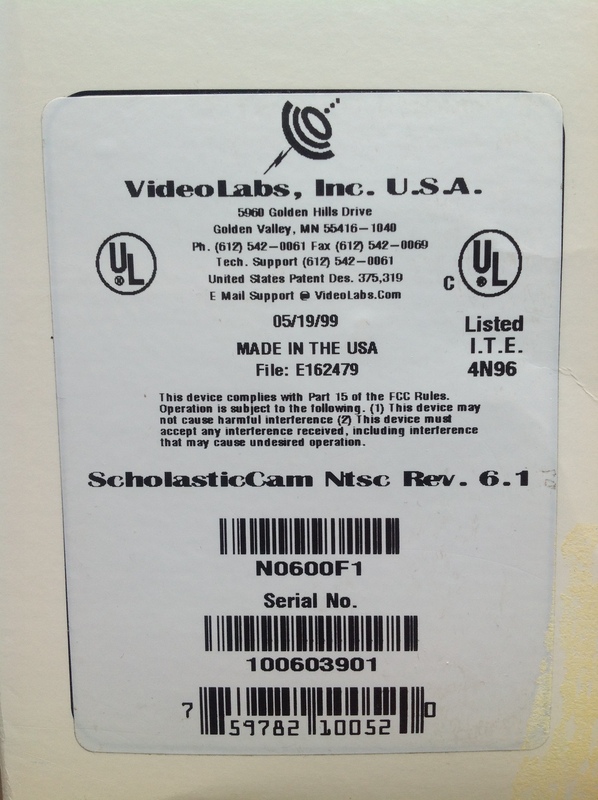 All of these video standards that the 1084 supports have a common scan frequency. So, for example all of the standard this monitor support have a 15.75 KHz horizontal scan frequency and could never support the Macintosh II’s 35 KHz horizontal scan frequency. Just to see for myself how well this monitor supports different standards, I cobbled together a little demonstration with some of the computers I have laying around. 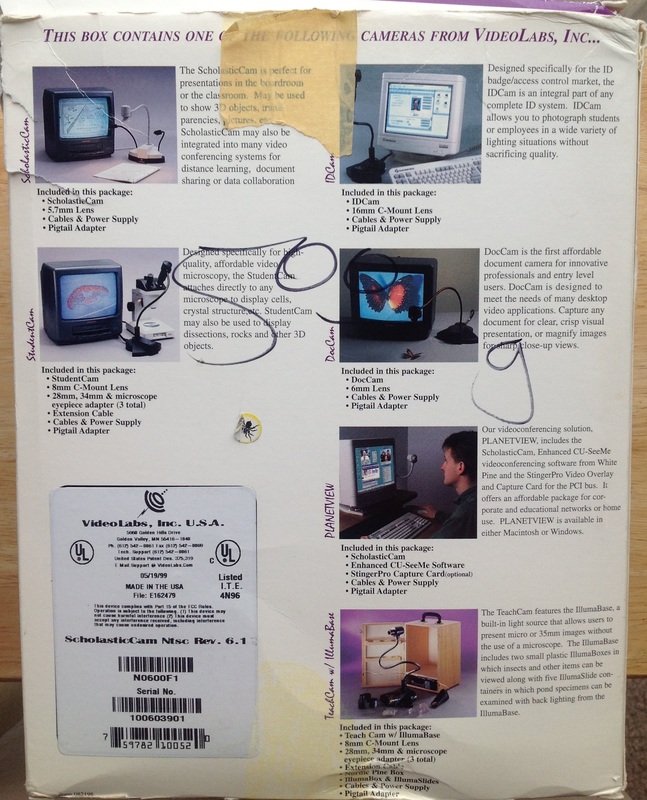 Keep in mind that taking photos of CRT monitors is a bit of a crapshoot. 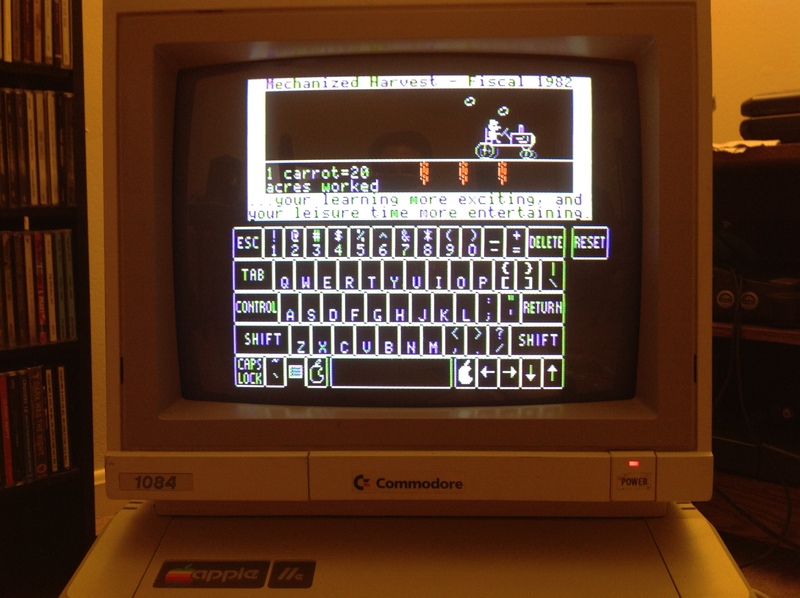 First, an Apple IIe on the composite input. 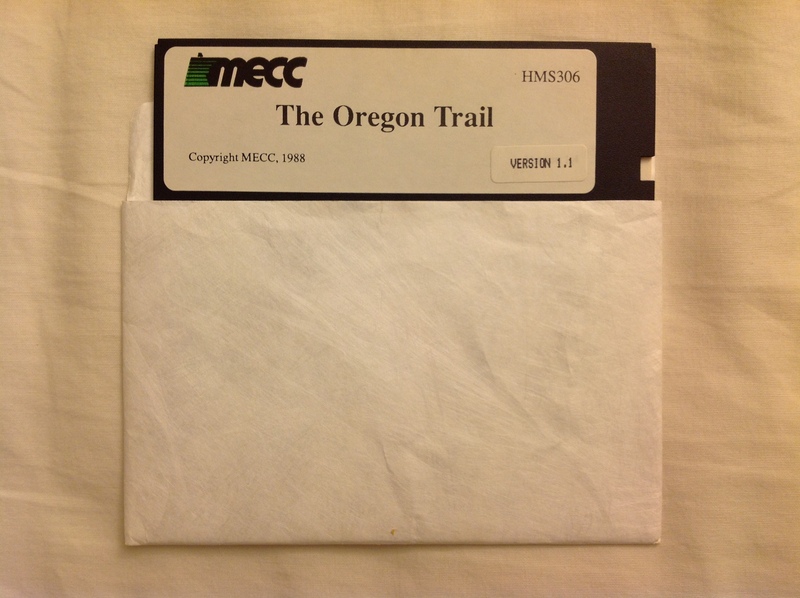 Here are some scenes from the Apple IIe’s famous “Apple Presents…Apple” demo and tutorial disk. 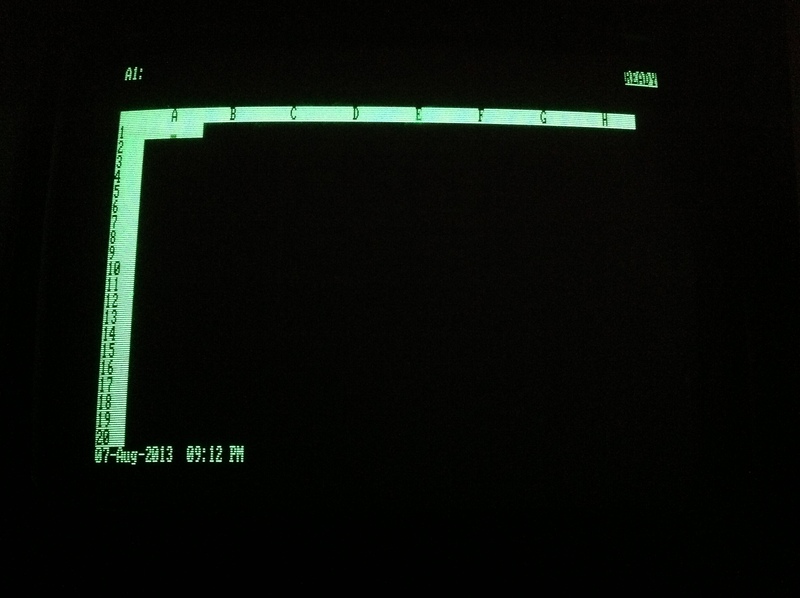 The Apple II’s color composite support was always a bit of a hack, and that’s why you’re seeing the odd green color fringing on the otherwise white onscreen keyboard. But, the orange carrots look fine. The memorable scrolling Apple logo looks nice and colorful. 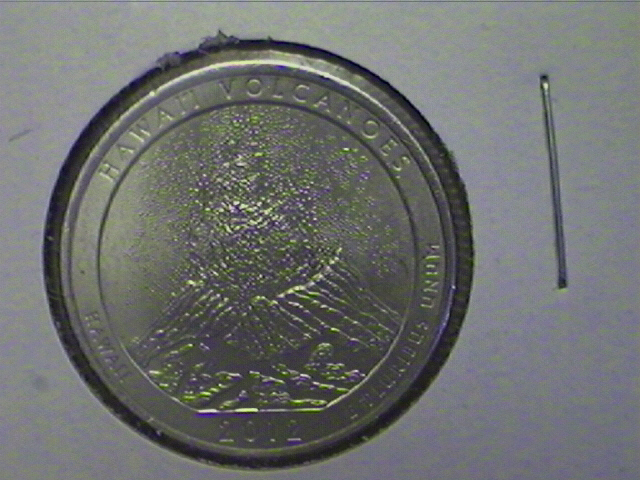 That banding is an artifact from taking the picture. 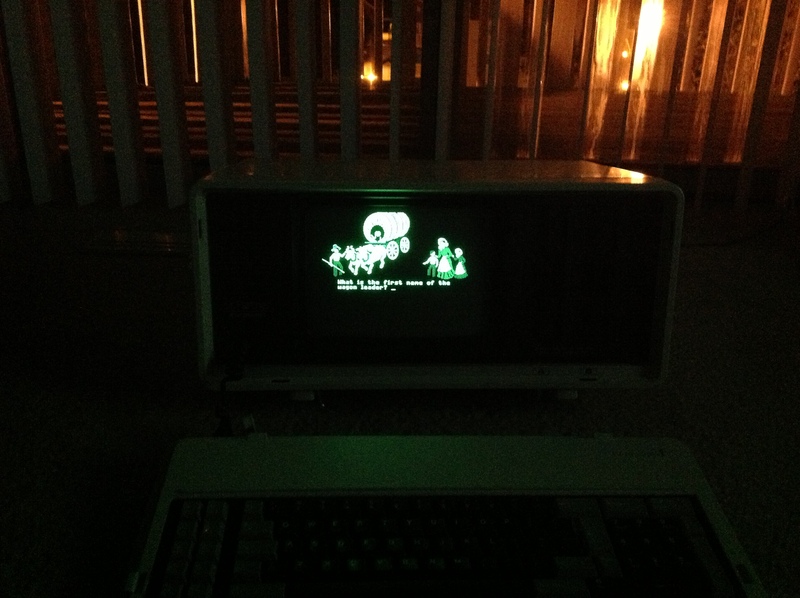 Here is a Commodore 64 on LCA/S-Video. 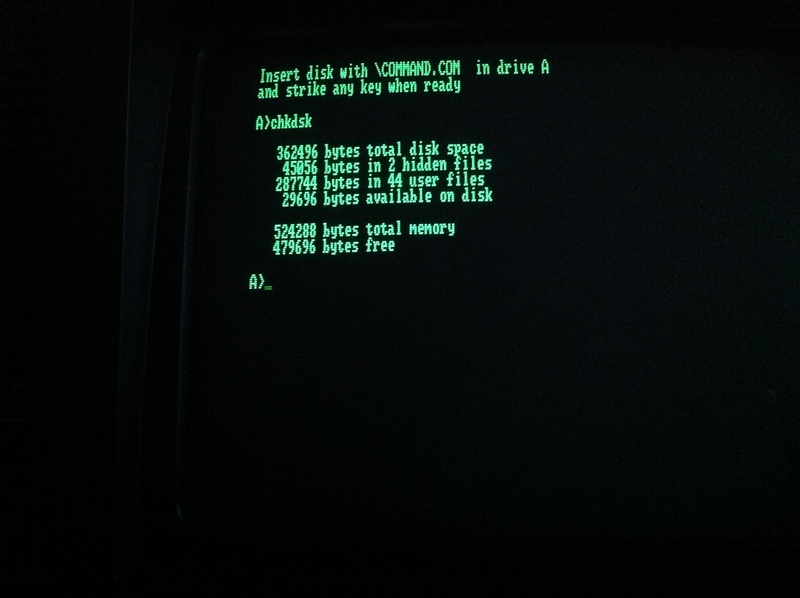 First, the famous Commodore 64 “64K RAM System” boot screen. That classic blue has never been bluer. 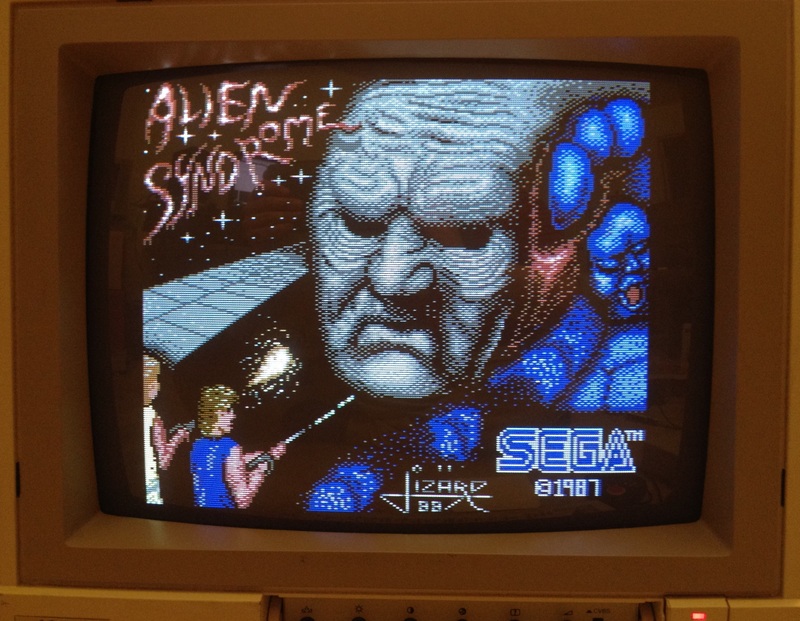 This title screen from Alien Syndrome looks fantastic and the accompanying audio that blares out of the 1084’s mono speaker is the bee’s knees. 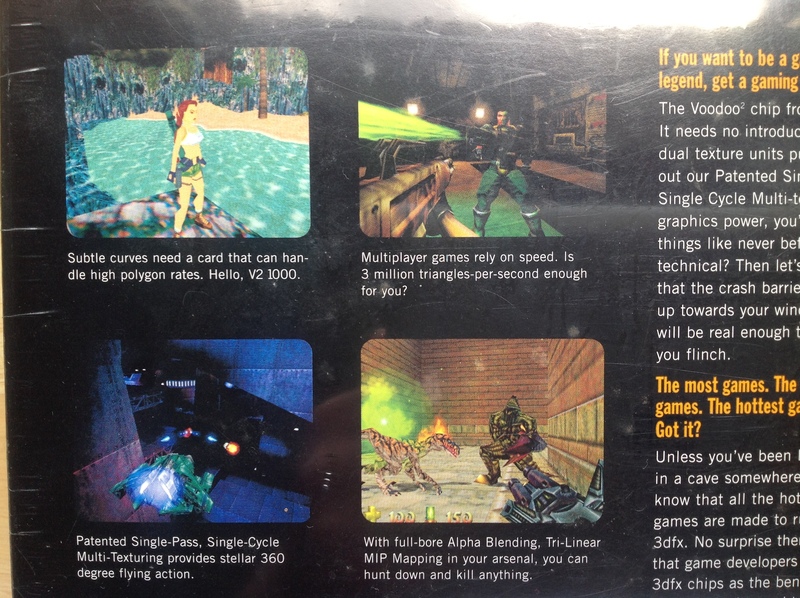 The GEOS demo disk looks beautiful as well. 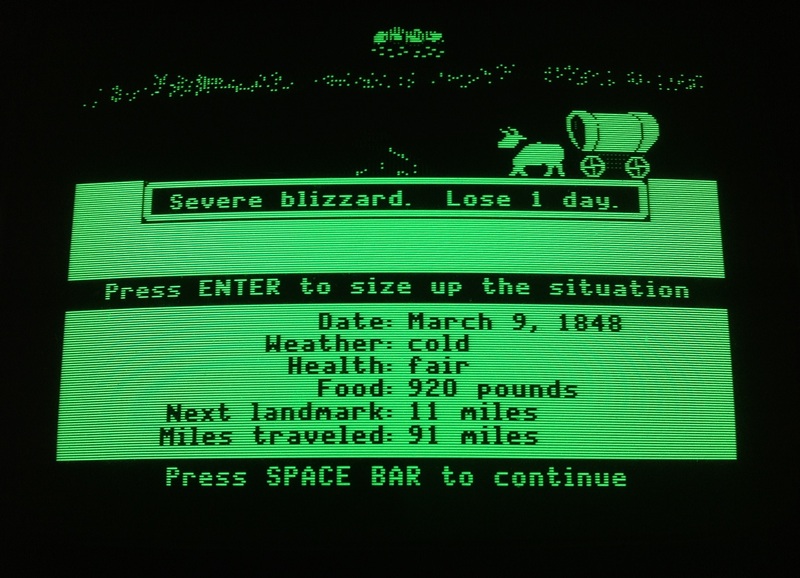 The kind of detail that you get from a Commodore 64 on S-Video just blows away the Apple IIe. Finally, CGA. 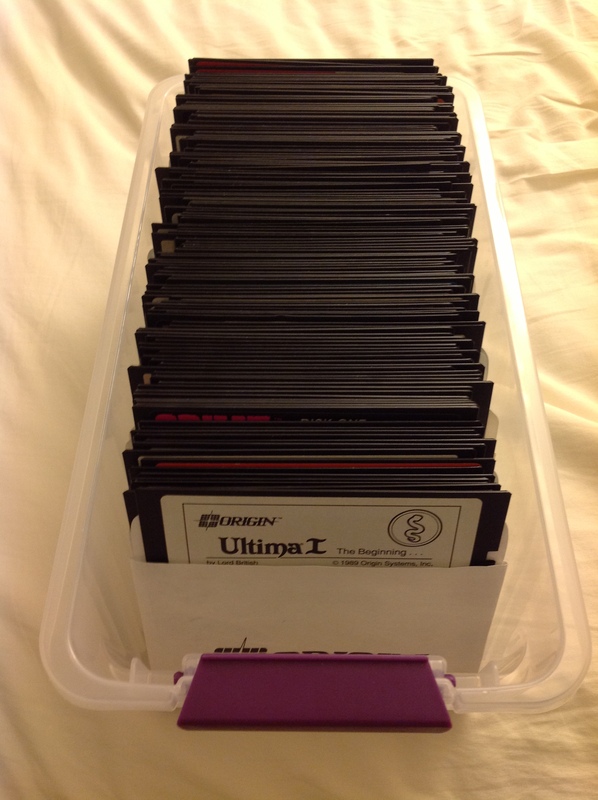 Now, I have to say that CGA is an abomination and one of the worst things that ever happened to the PC. 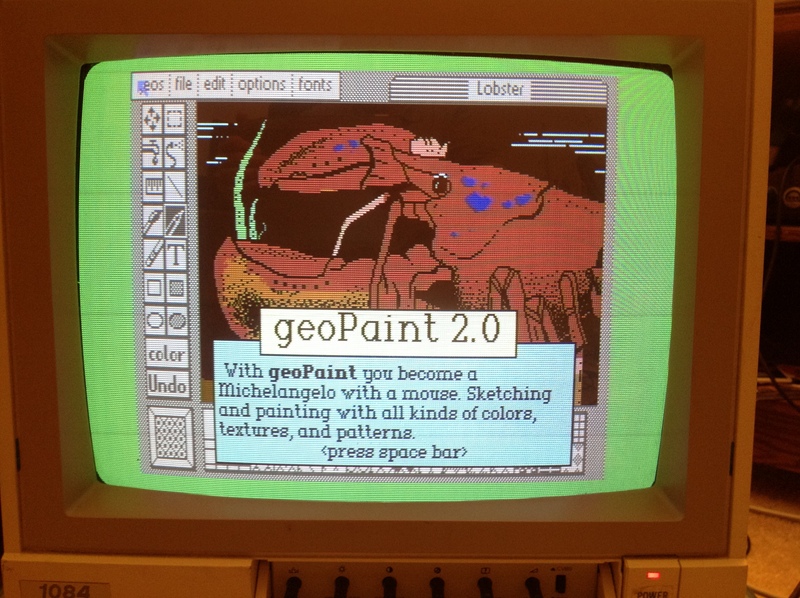 CGA and it’s awful color pallet set back PC gaming for years. 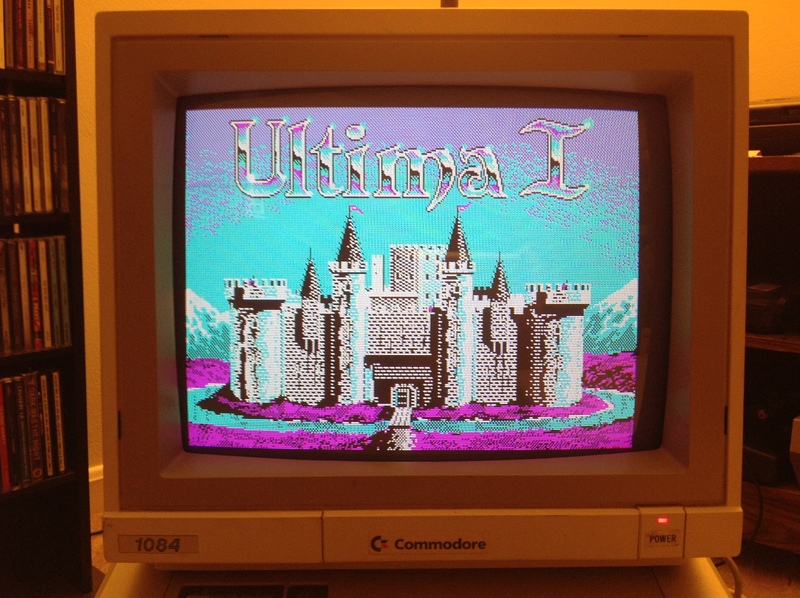 But to prove it can be done, here is the Ultima I title screen in all of it’s purple and teal CGA glory. 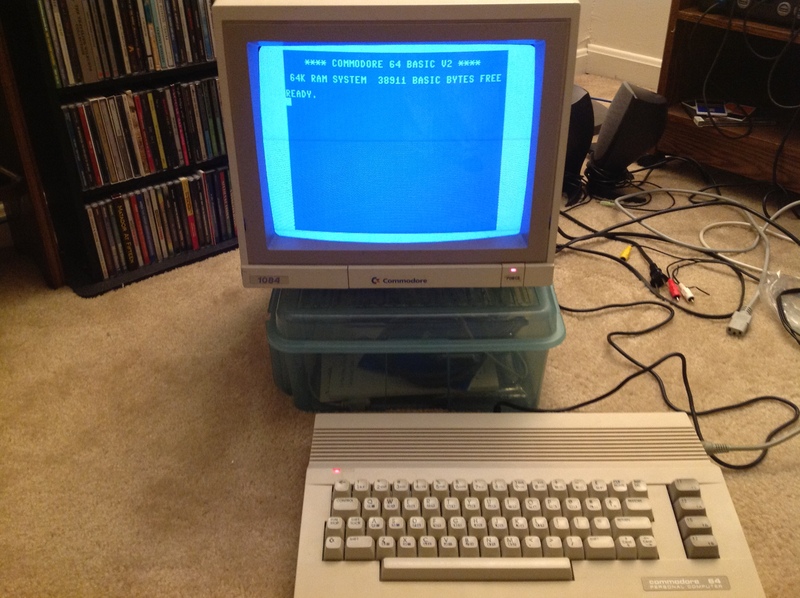 Confusingly, I’m using the Apple IIe as a stand here for the 1084. The PC is actually a Panasonic Senior Partner “luggable” 8088-based PC clone (that will undoubtedly be featured in a future post). 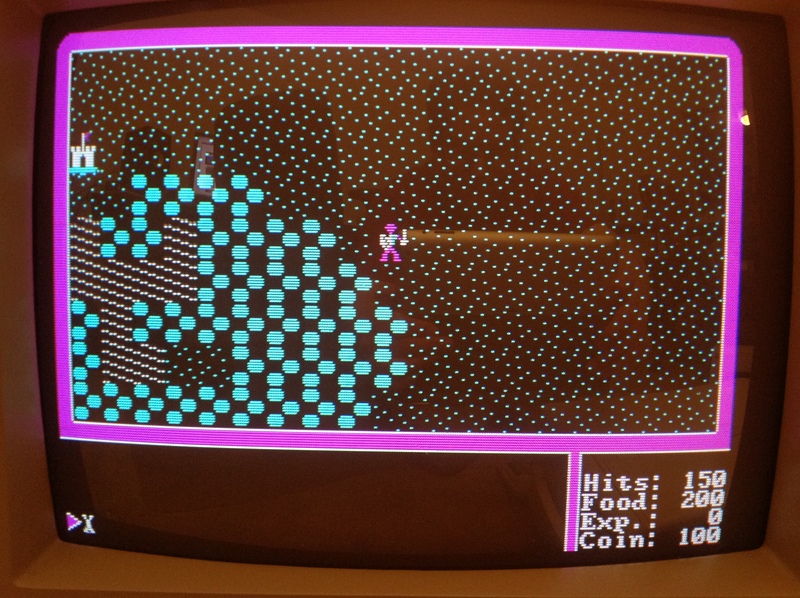 Here’s what Ultima I gameplay looks like in CGA….Yuck, but not the monitor’s fault. Finally, I didn’t realize the 1084 had a plastic fold-down kickstand until I watched a YouTube video by vwestlife where he demonstrated the kickstand on his 1084. After compiling this demonstration, I’m very impressed. 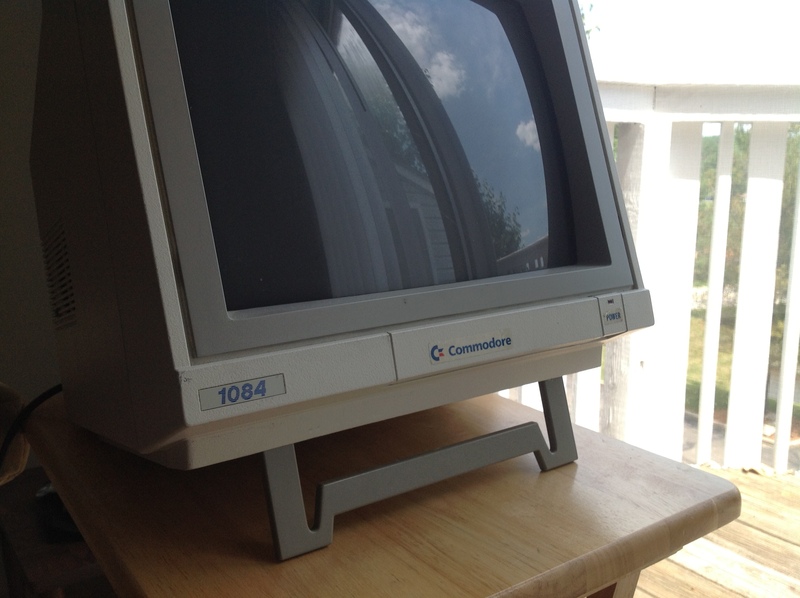 It may not be as pleasant looking as one of Apple’s Snow White-era monitors but the Commodore 1084 is a computer collector’s dream in terms of versatility. This is my HP-12C financial calculator, which I bought from Shopgoodwill last year. It came in this beautiful case and just required some new batteries to start working. To the extent that it’s possible for a pocket calculator to be legendary, that’s what the HP-12C is. 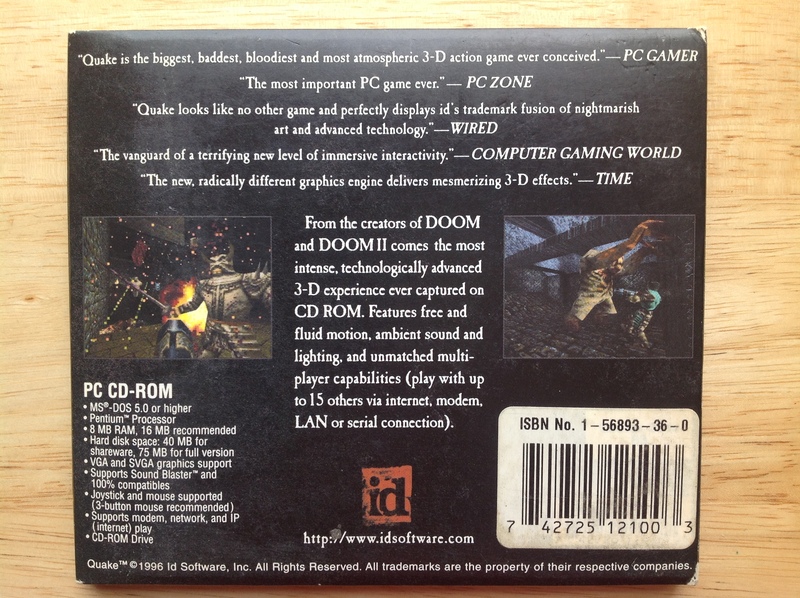 When it turned 30 in 2011, it was covered in the Wall Street Journal and on major blogs like Technorati. HP even posted a celebratory video on YouTube entitled HP 12c Calculator — Then & Now. 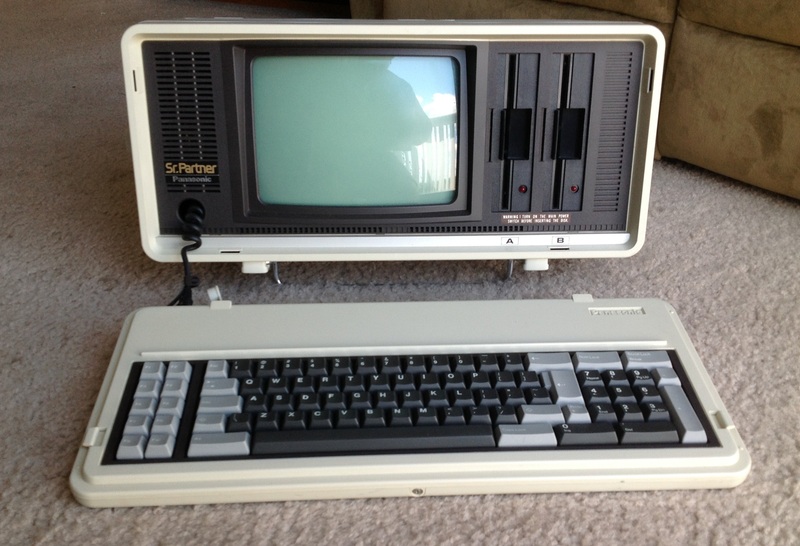 Despite the fact that it was first released in 1981 (the same year as the IBM PC) it’s still being sold today. You can buy one new at Amazon, or from Staples, or OfficeDepot, or Walmart and the price you will pay is not what I would call cheap. 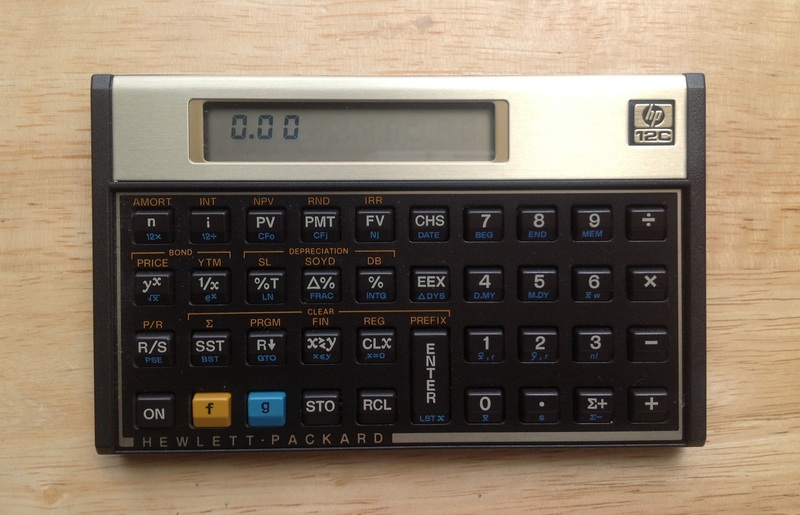 I don’t actually have much use for a financial calculator but I bought this HP-12C for two reasons: First, because a Reverse Polish Notation calculator seemed like a great nerd novelty item and second because it’s a classic of early 1980s technology. Today the vast majority of pocket calculators and small desktop calculators you see are extremely cheap commodity crap. But, there was a time when a calculator was a prized possession, probably the most advanced piece of technology a person owned. 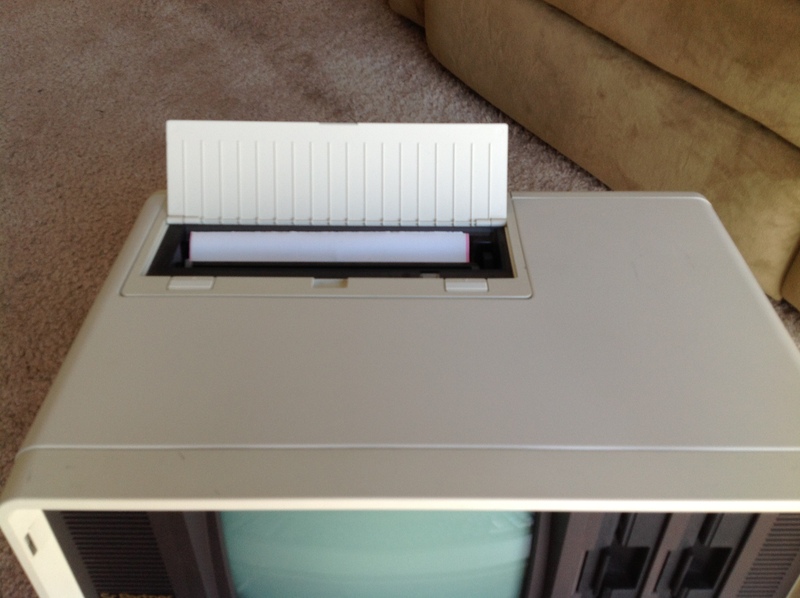 The HP-12C is one of the last remnants of that era. The HP-12C is a member of a line of calculators that HP created for different professions in the early 1980s including the HP-10C, HP-11C, and HP-15C scientific calculators and the HP-16C programmer’s calculator. The HP-12C apparently has endured because finance professionals loved their portability and reliability of the HP12-C and required newcomers to learn how to use them. 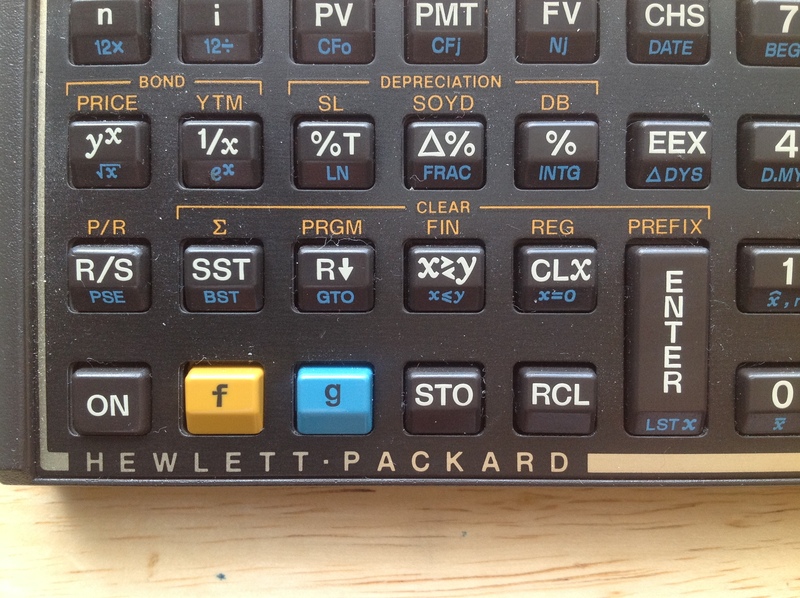 Unlike most calculators the HP-12C uses Reverse Polish Notation (RPN). In order to add two numbers you do not type 2 + 4 and press =. Instead, you press 2 and then press Enter. Then you press 4 then you hit the + button and your two numbers are added together and 6 shows up on the screen. You enter the numbers first and then the operation. Why would you want a calculator that works like this? Believe it or not, the process of using RPN is similar to the way you learned math. If you think about it, you have to modify the way you learned math in order to use an algebraic mode calculator. Algebraic method: Add 3+5=8. Write down the answer or store it in memory. Add 7+6=13. Now enter the 8 from the first answer and then divide it by entering the second answer to get x=0.62. RPN method: Touch 3 then the ENTER key. Touch 5 then the + key. Touch 7, and then ENTER. Touch 6 then the + key. Note that the answer to the second sum is displayed. Now here’s the magic part. Touch the divide key and the calculator gives the answer, 0.62. Algebraic: 13 strokes, not counting the effort to write down or memorize the first answer while you calculated the second answer. RPN: 9 strokes, and no need to write anything down. The beauty of this is that in RPN the order of operations is explicit. As computer science buffs are aware, RPN works on a stack. Basically each new number you put in is pushing down a new entry on the stack and each operation is popping off numbers from the stack in a last-in, first out order. As a result, when the divide button is pressed 13 and 8 are popped off of the stack and 8 is divided by 13 giving us 0.62. Because there’s a stack there’s a fairly sophisticated memory function basically built in. The HP-12C is actually a small computer. Unlike most pocket calculators which have a relatively primitive fixed-function calculator IC there is actually a CPU inside of an HP-12C. 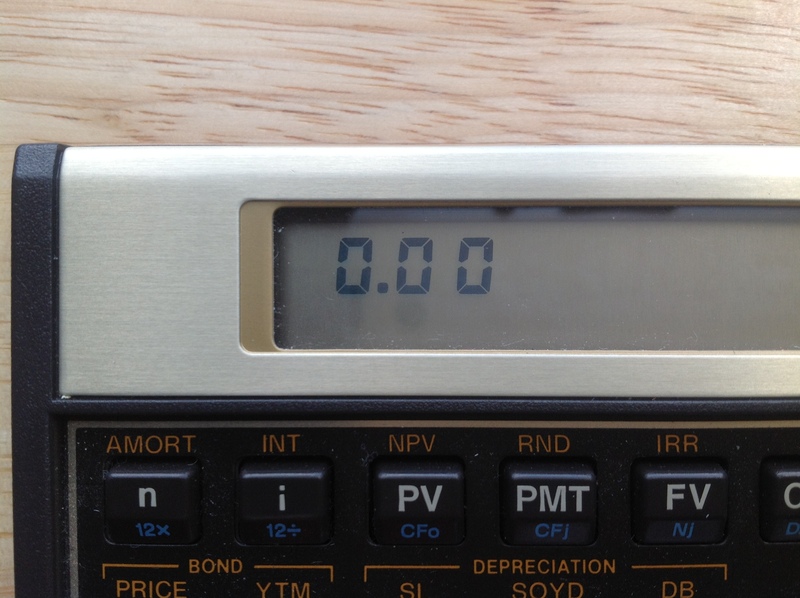 When you push a button the calculator is actually loading a tiny program into the CPU. The HP-12C and the other members of the HP-10C line all used the same CPU, referred to as Voyager, with different code assigned to the different buttons on each model. 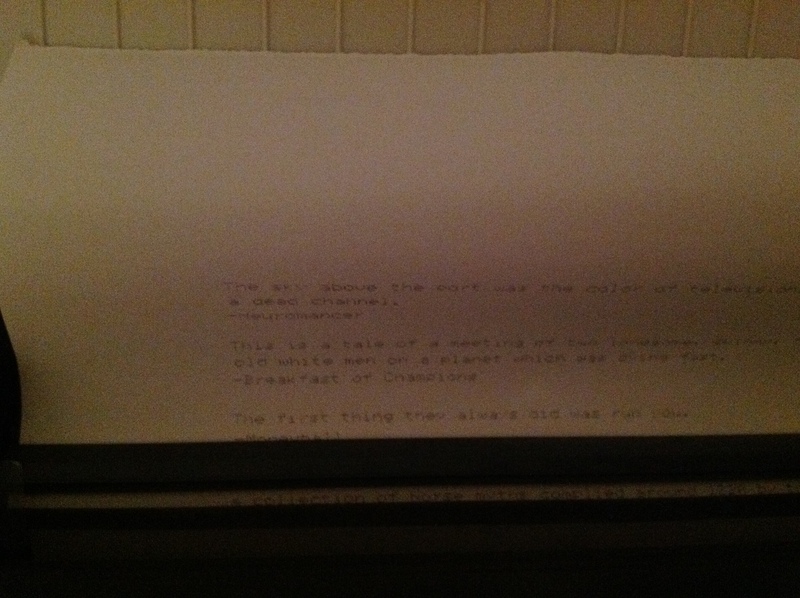 The HP-12C is actually programmable. That is to say that it has what we would today call a macro language where you can store up to 99 lines of operations and recall them at a button press. 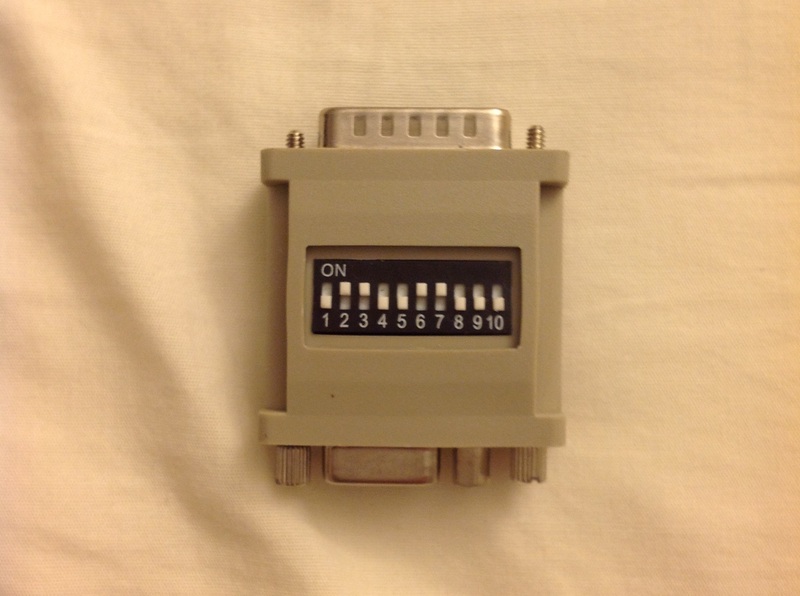 Because it is programmable there are honest-to-goodness games (warning: PDF) people have written for this pocket calculator. 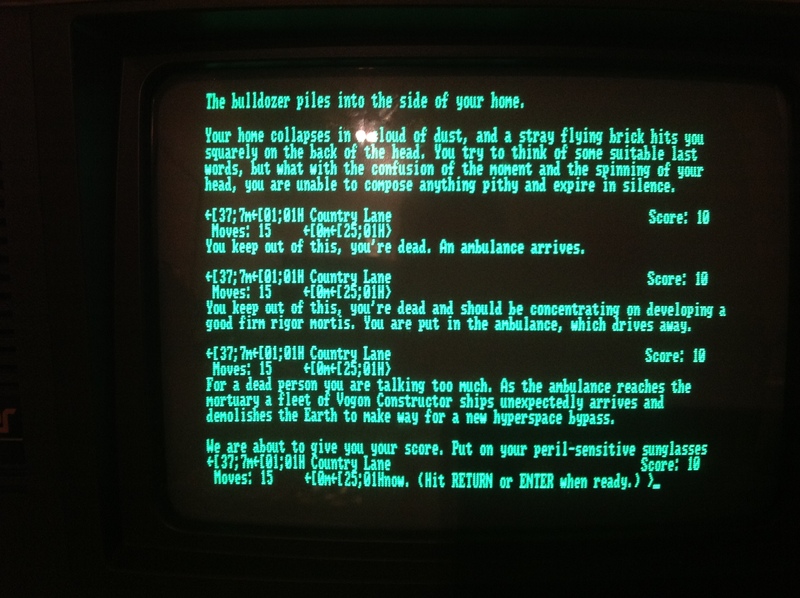 You have to key them in one line of code at a time, like old BASIC programs on early home computers. 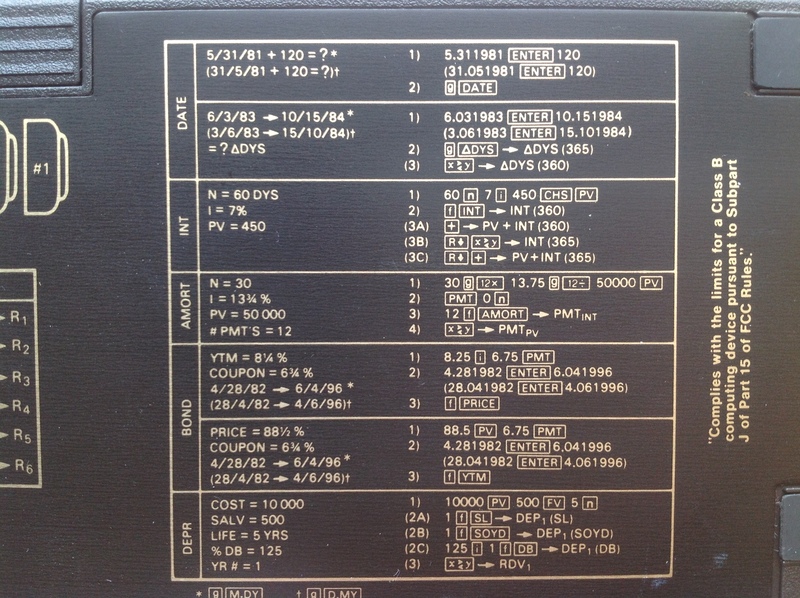 On the back of the HP-12C is this sort of quick explanation of some of the calculator’s functions. The fact they’re written in gold lettering, and that there’s a ton of information contained in them that’s somewhat hard to decipher reminds me a bit of the pictograms on the Voyager Golden Record. The gist of these things is that the programs trigger by those buttons are capable of some sophisticated data conversions, like finding the number of days between two dates. Additionally there are five special registers (basically memories) for Time Value of Money financial calculations called n, i, PV, PMT, and FV. A wide variety of financial calculations can be done by entering numbers into those registers and running the little programs on them. 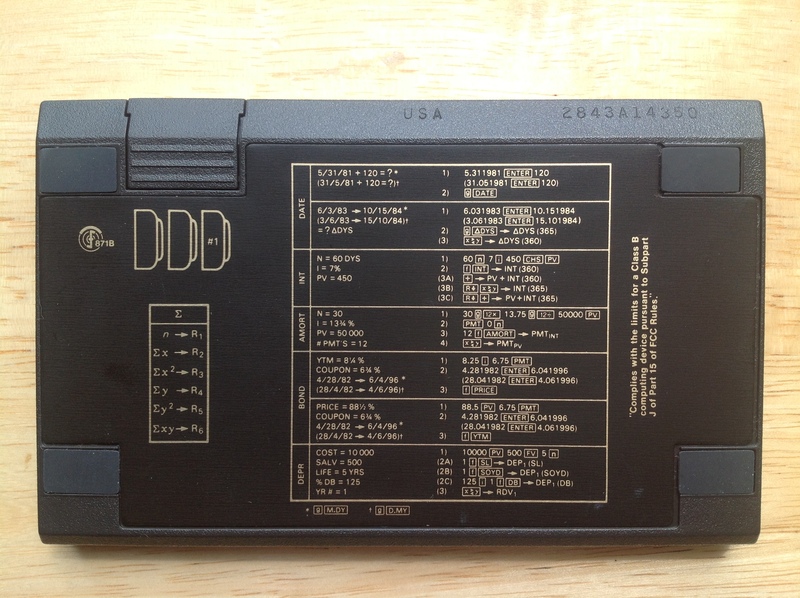 If this serial number decoding explanation is correct then my HP-12C was made in the United States during the 43rd week of 1988. As you would expect from a consumer electronics device that has been made for three decades, there have been several revisions of the HP-12C over time. Suffice to say that over the years they have kept the button arrangement and external appearance the same but re-arranged the innards several times. 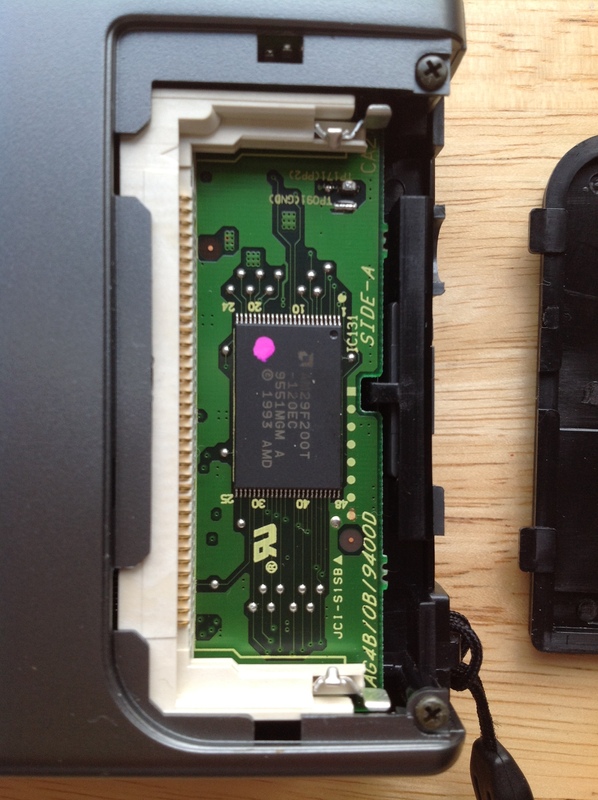 According to this site, the HP-12C originally had two chips: a CPU chip and a ROM/RAM/Display Driver chip. 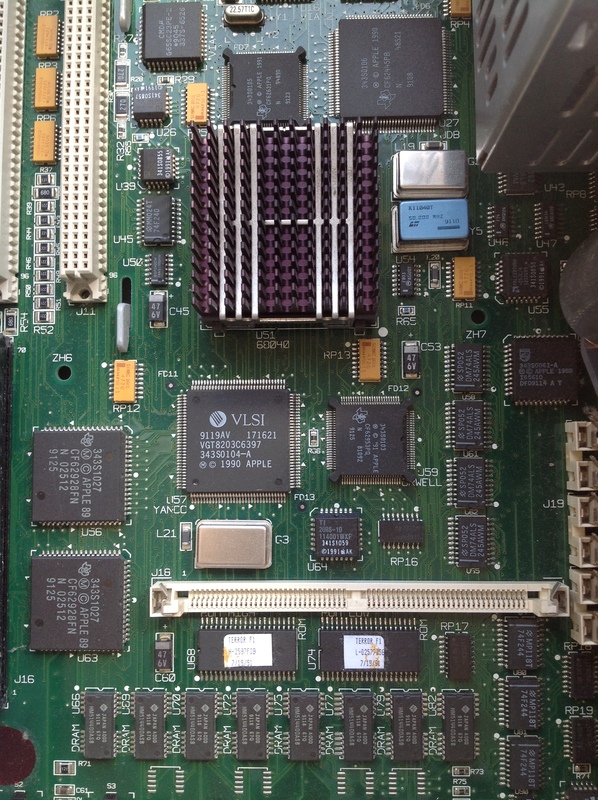 By the 28XX series like mine the two chips had been merged into a single chip where the Voyager CPU chip also contained the other chip’s functionality. Interestingly, if you buy an HP-12C today what you get is outwardly nearly identical but very different inside that the older one I have. 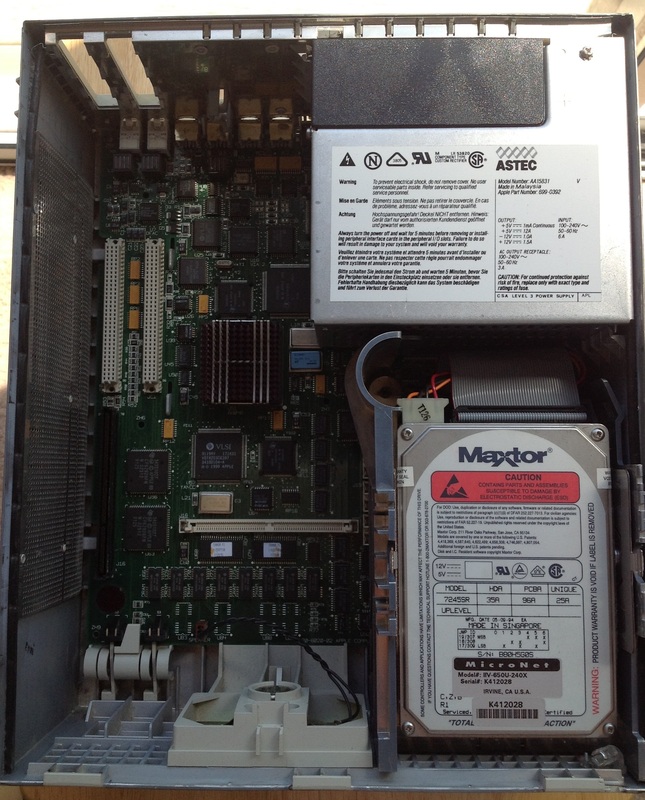 The old Voyager CPU has been replaced with an ARM-based CPU. ARM CPU cores have been famously used in everything from the Game Boy Advance to the iPhone and Android devices. They’re ideal for situations where you need a CPU that uses a tiny amount of power for a specific task. 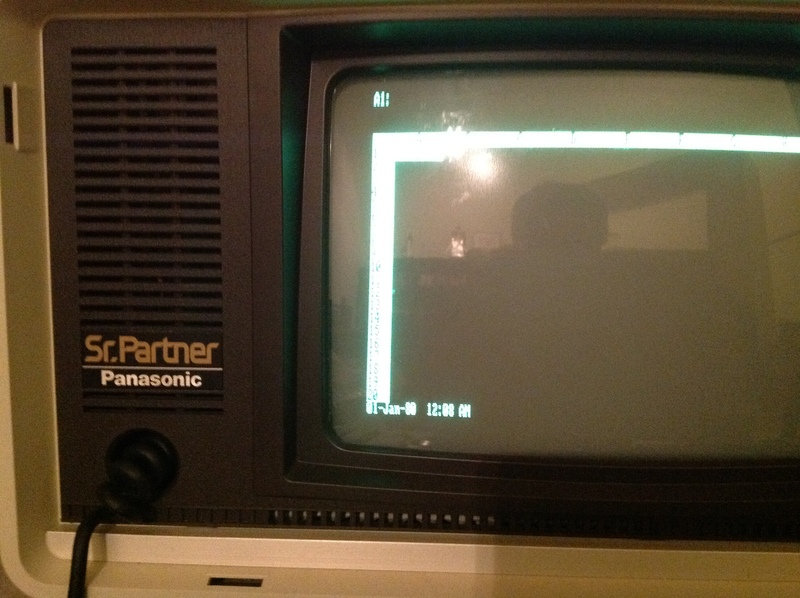 In the HP-12C, I believe what they’ve done is created an emulator that uses the ARM CPU to faithfully reproduce the functionality of the old CPU, but with faster execution speed. 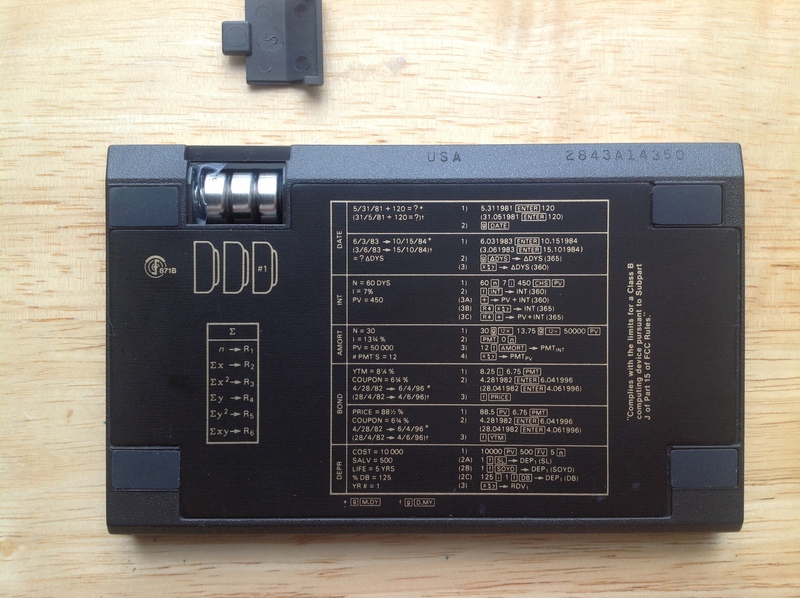 These newer HP-12Cs can be identified visually by the fact that they now have two button batteries that go in horizontally, rather than three that face vertically.